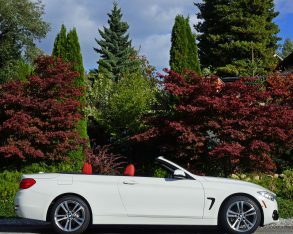 coast are changing from bright greens to golden yellows, deep reds and myriad other tones in between, while much shorter days that don’t include at least a sprinkling of rainfall are fewer and farther between. 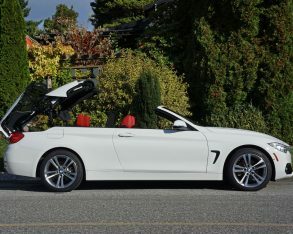 Yes, it’s the perfect time go for a drive in a convertible. 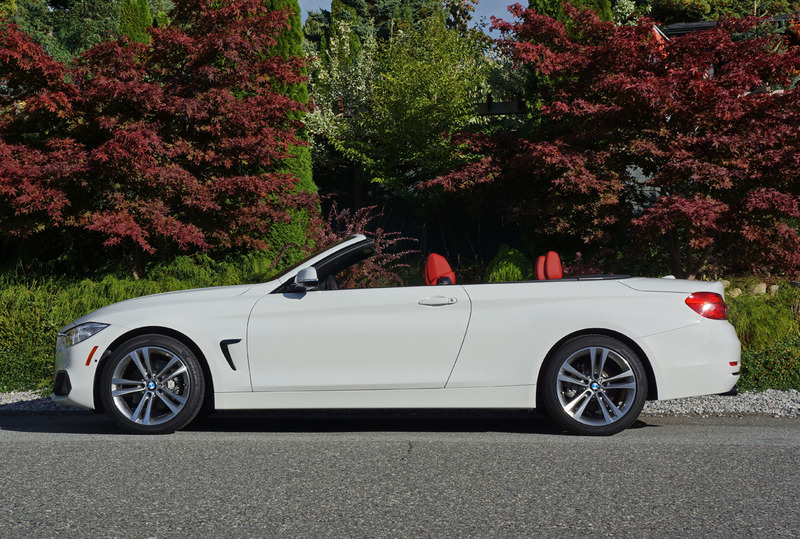 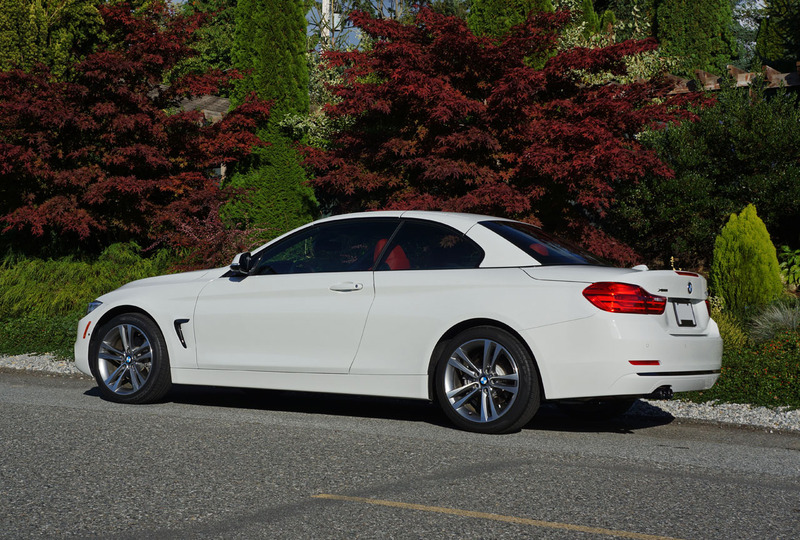 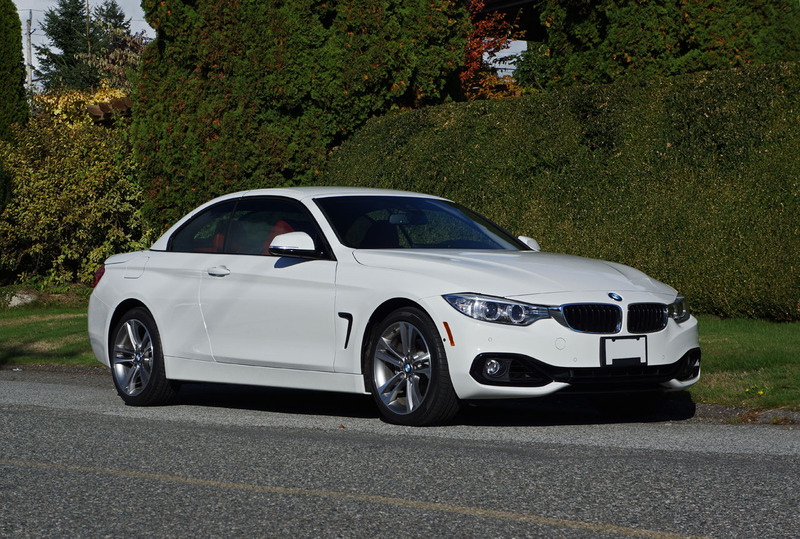 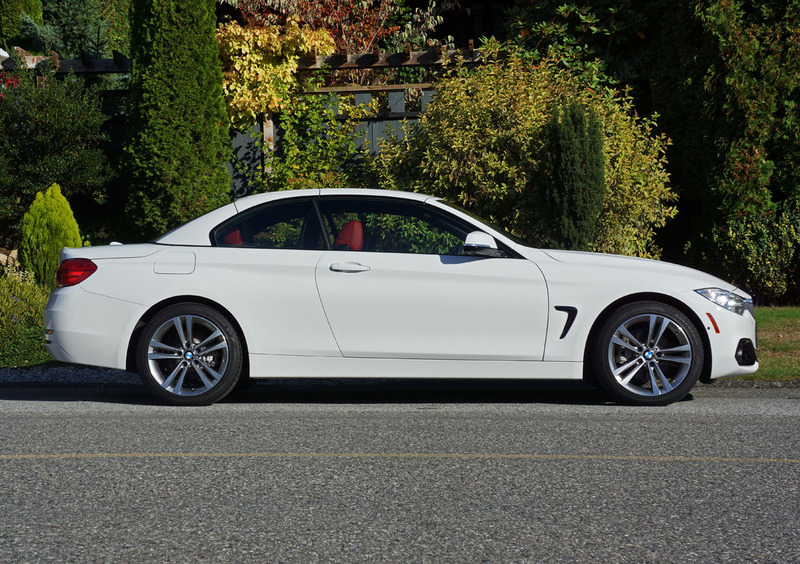 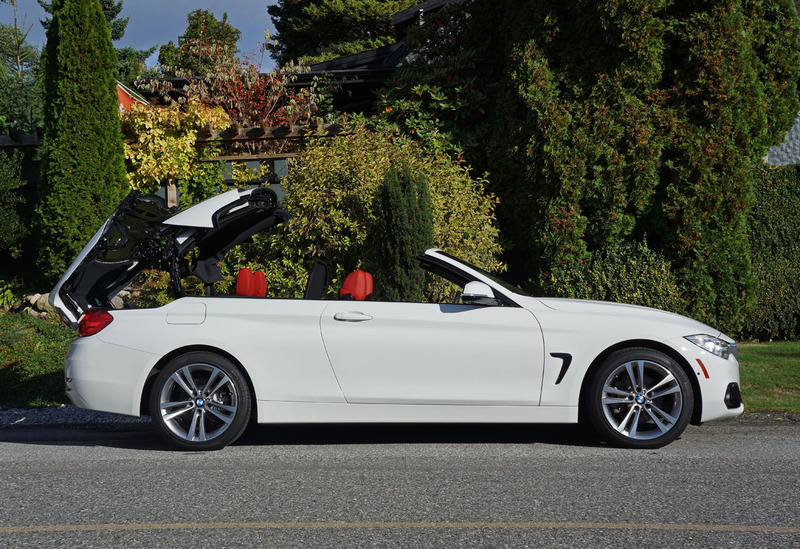 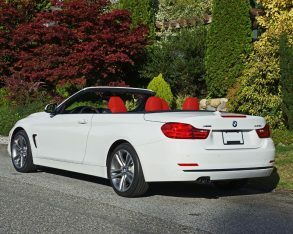 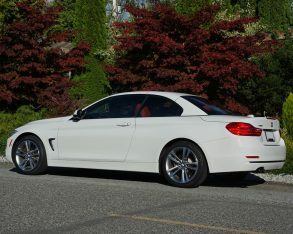 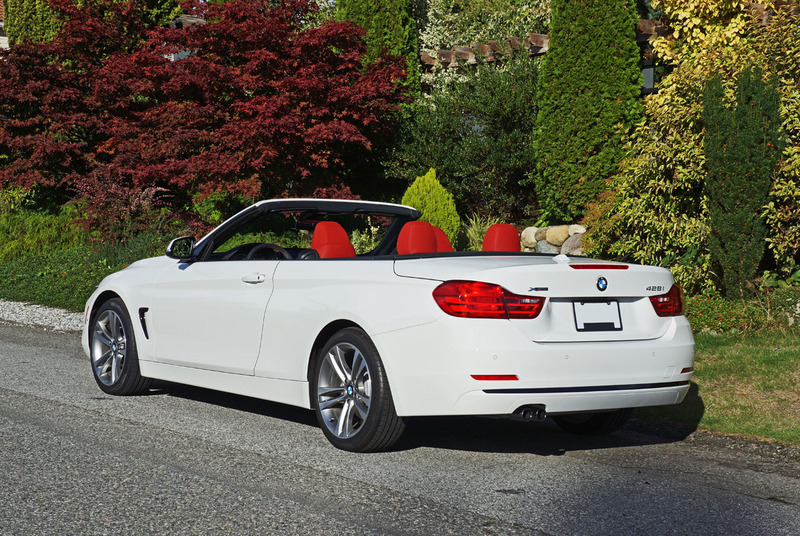 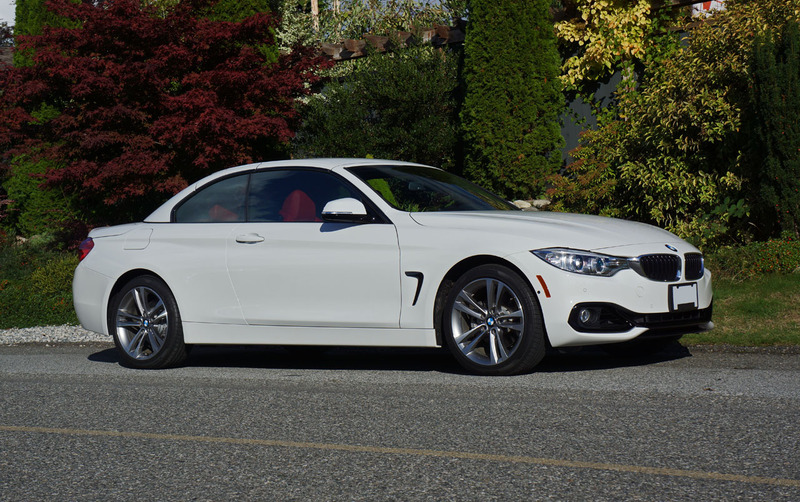 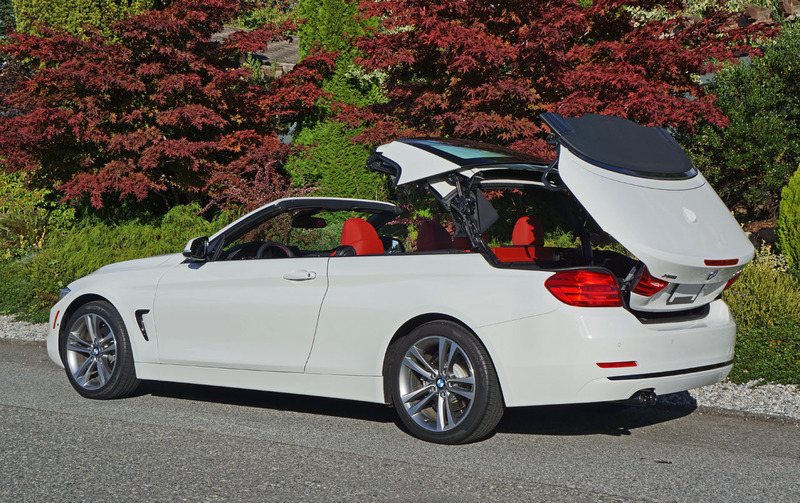 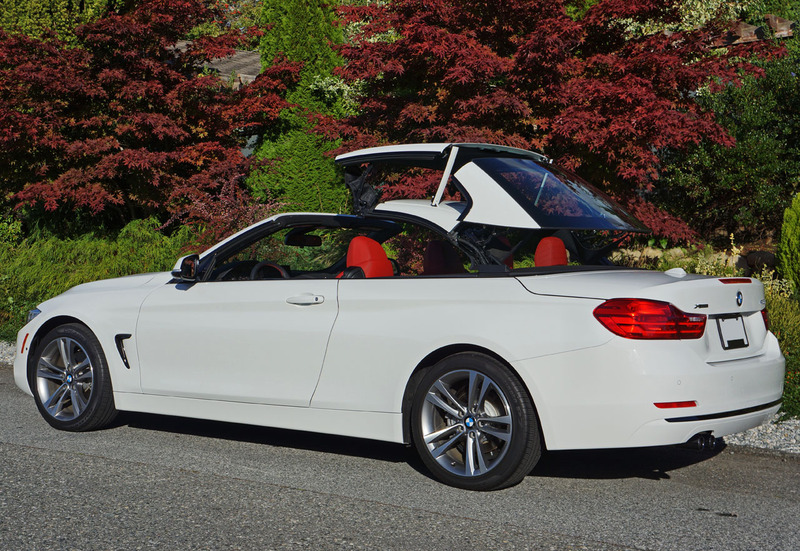 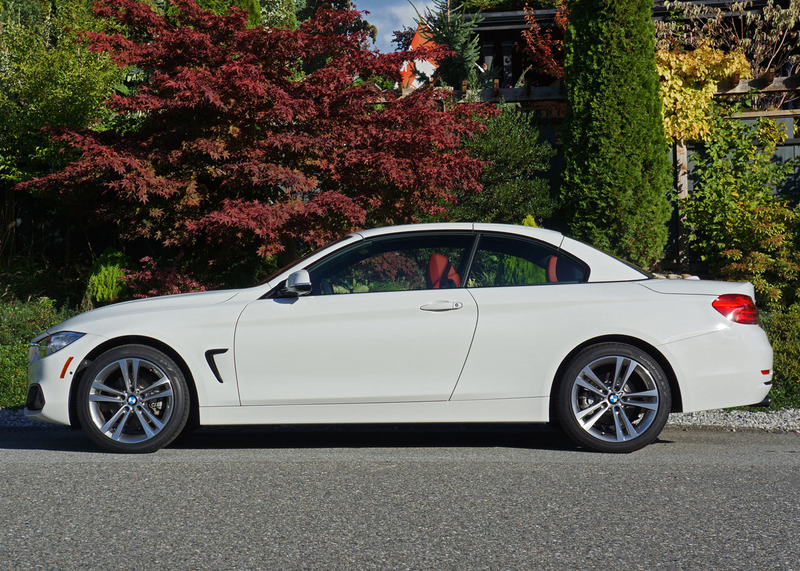 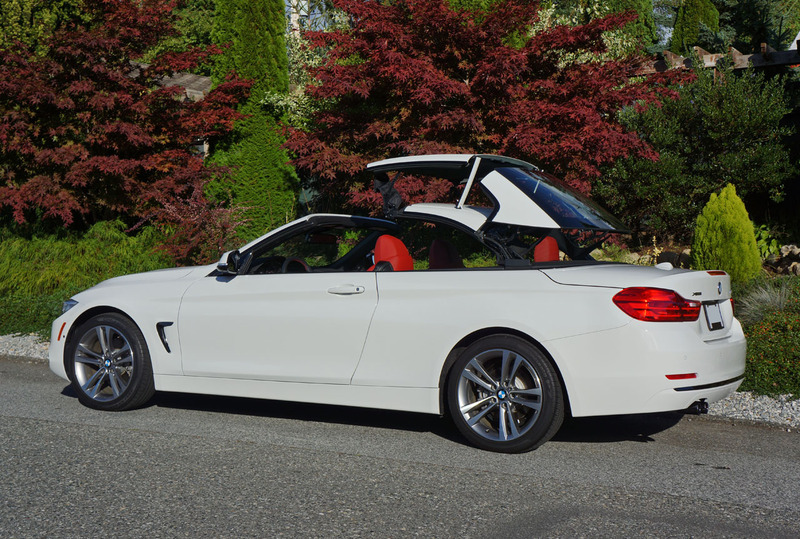 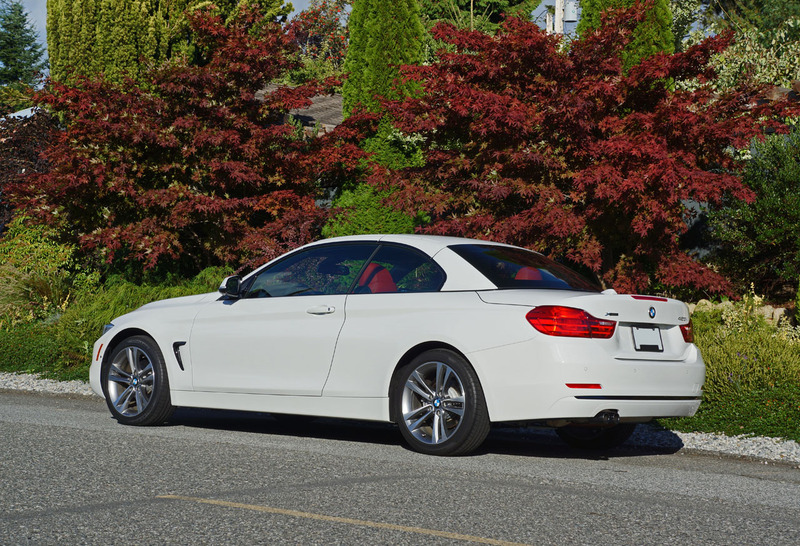 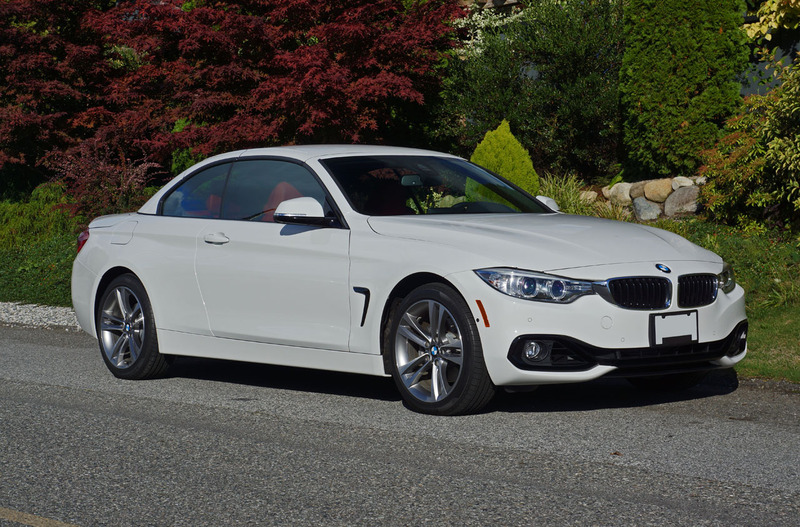 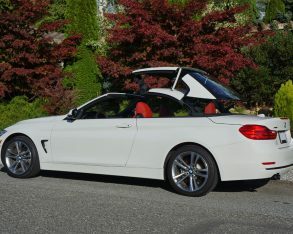 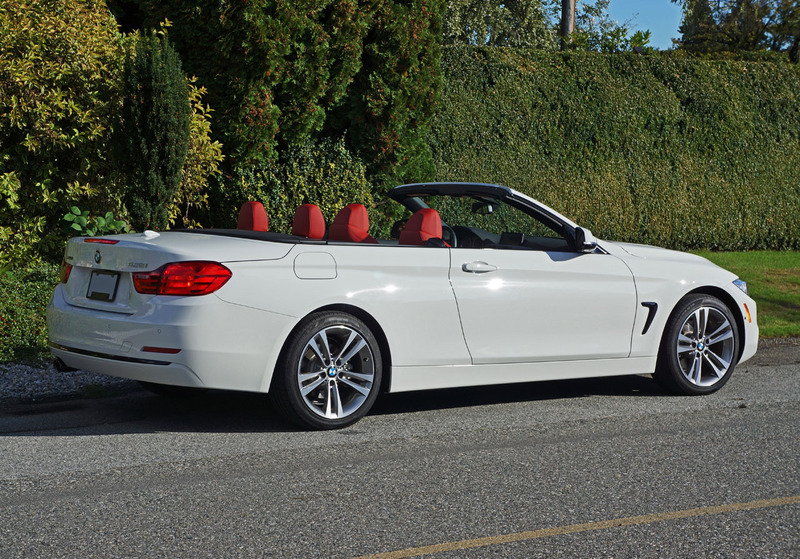 direction, while its retractable hardtop makes it the ideal all-season sport coupe. And don’t worry, I was able to drop the top a number of times, a process that takes just 20 seconds so is well within the change interval of the average stoplight if you arrive in time, and if you don’t time it just right you’re ok to drive away at speeds close to 20 km/h mid-process, something the old model couldn’t do. 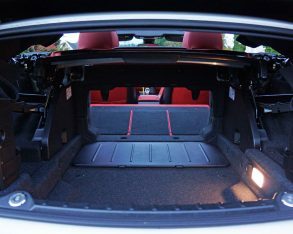 aluminum (and glass) panels consume a significant percentage of that cargo hold, resulting in a mere 230 litres remaining, not to mention a rather small gap to wiggle things through in order to get them in and out. 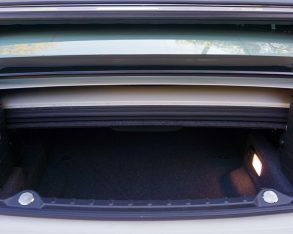 Or at least that’s how it looks at first glance. 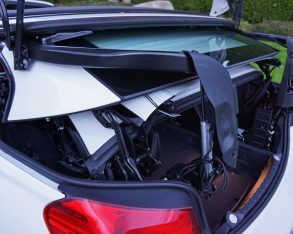 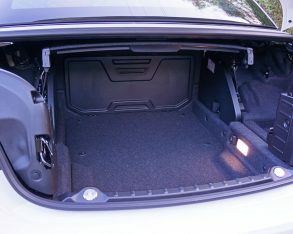 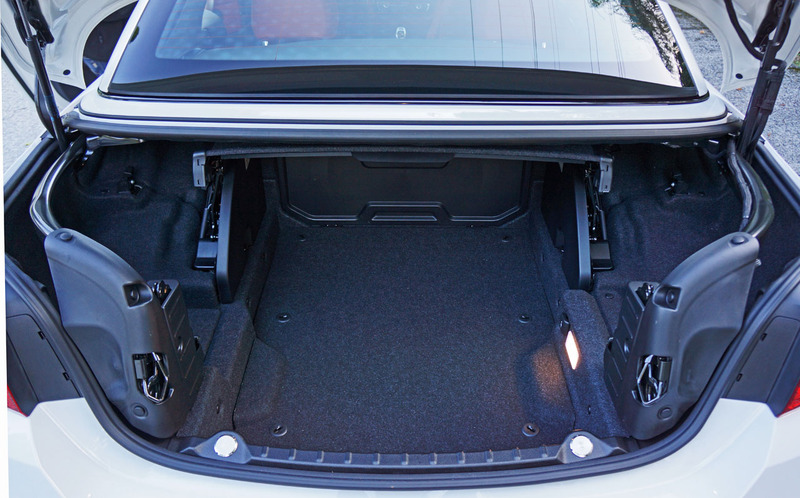 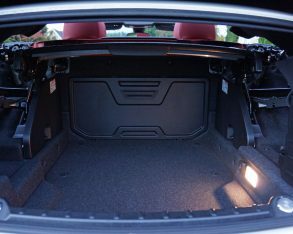 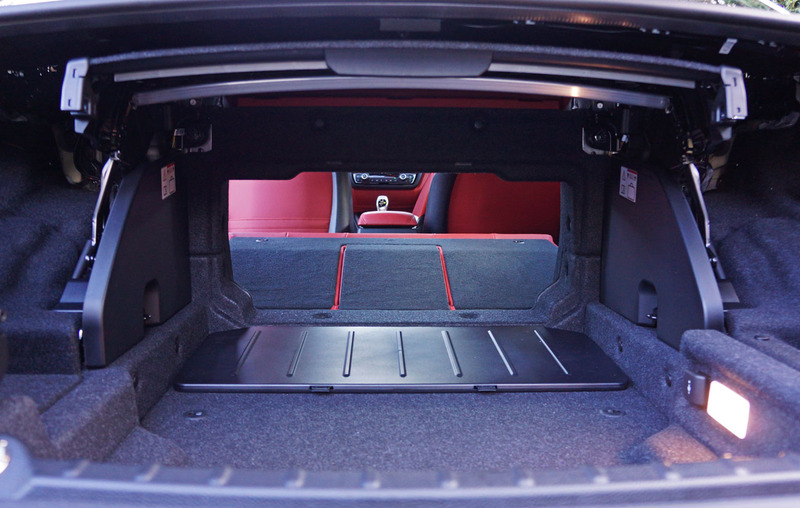 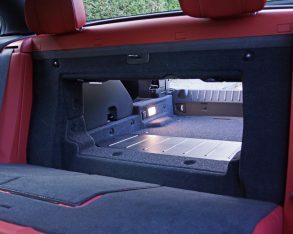 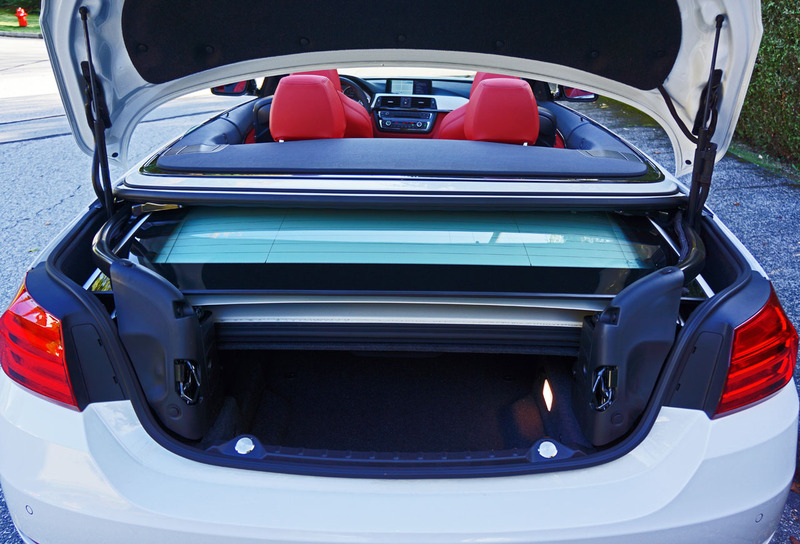 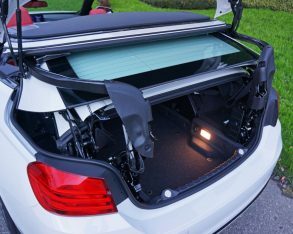 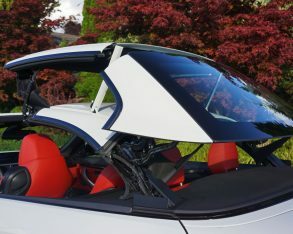 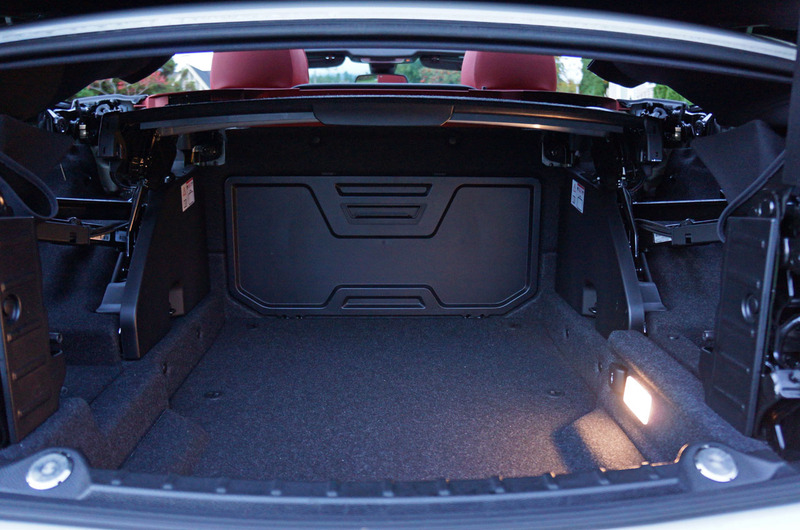 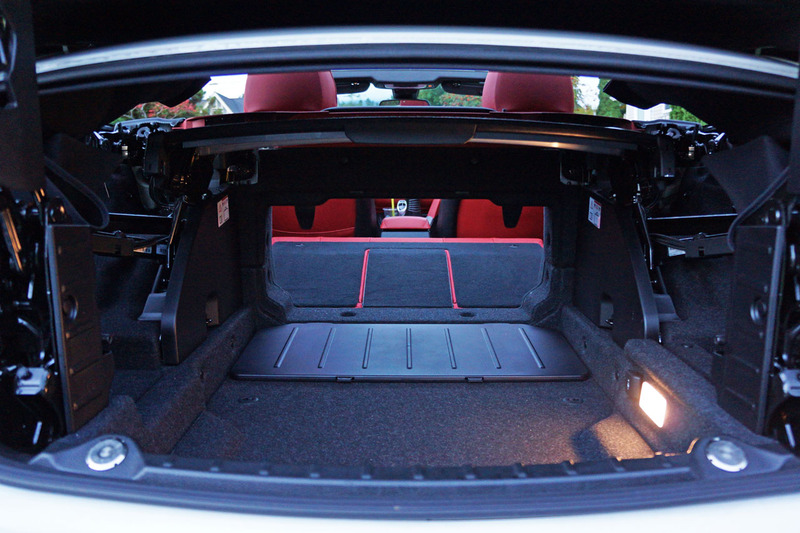 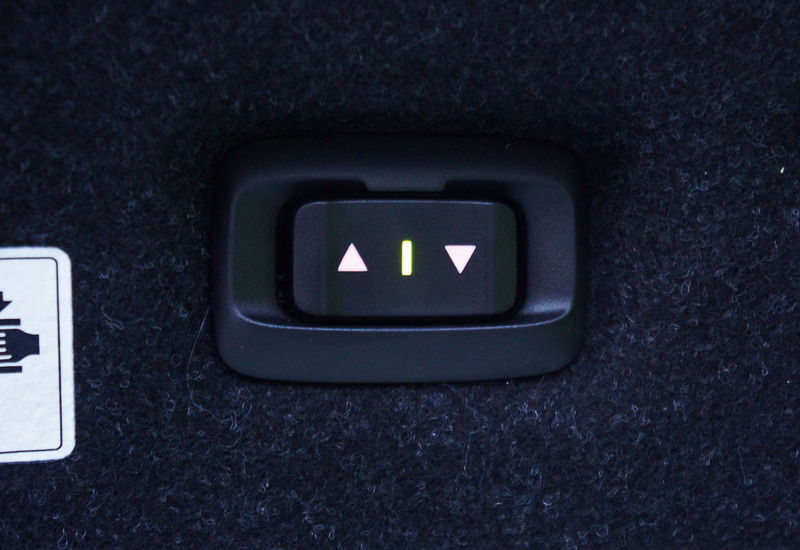 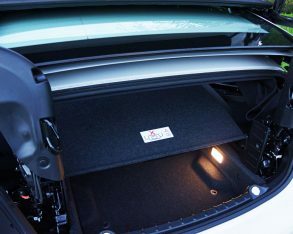 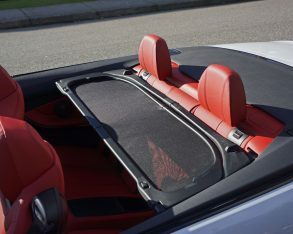 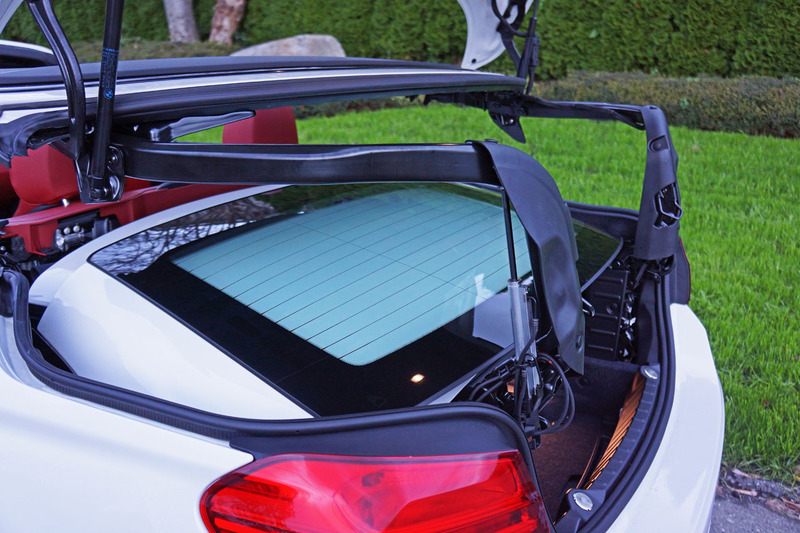 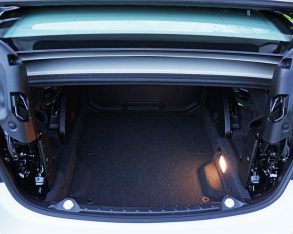 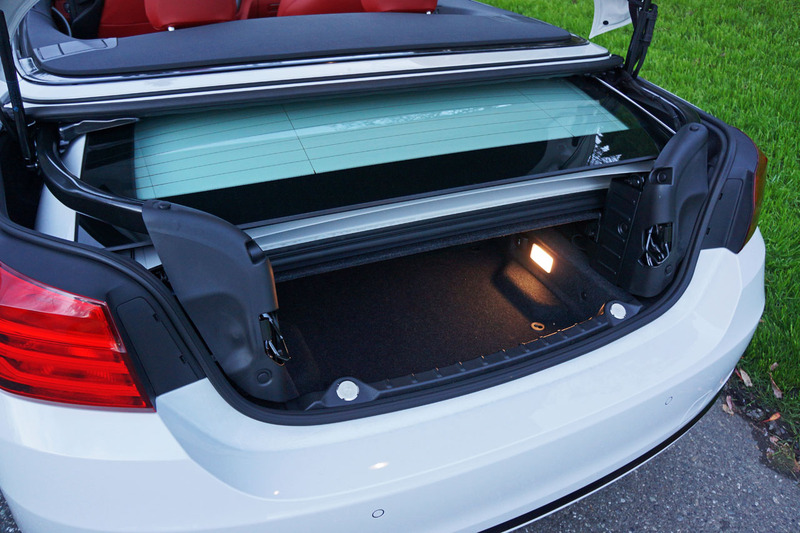 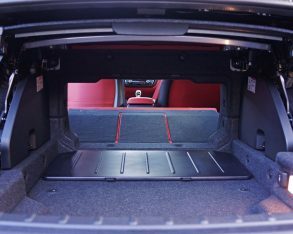 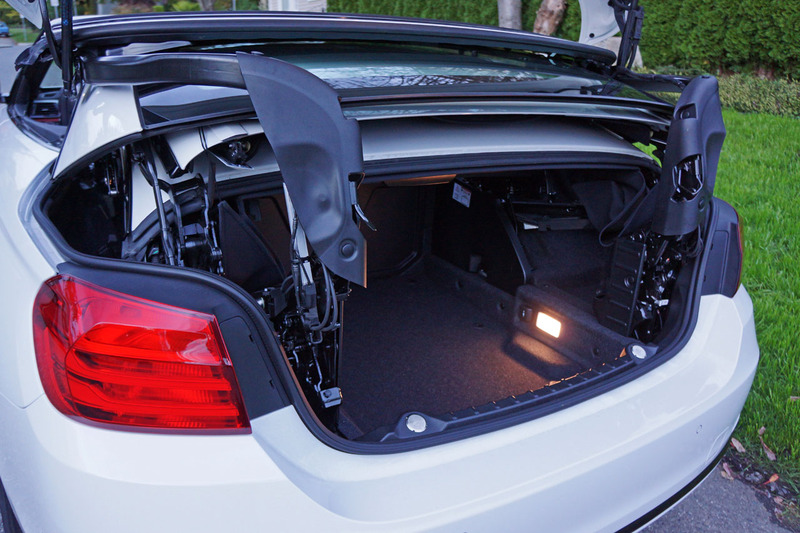 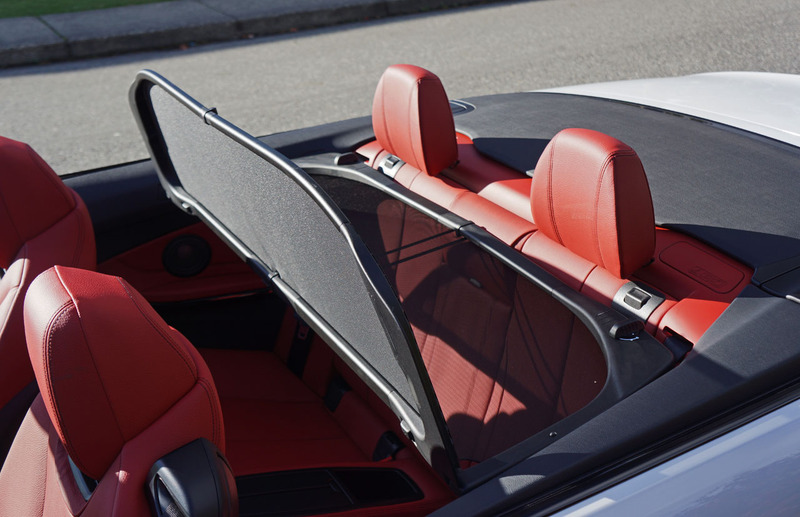 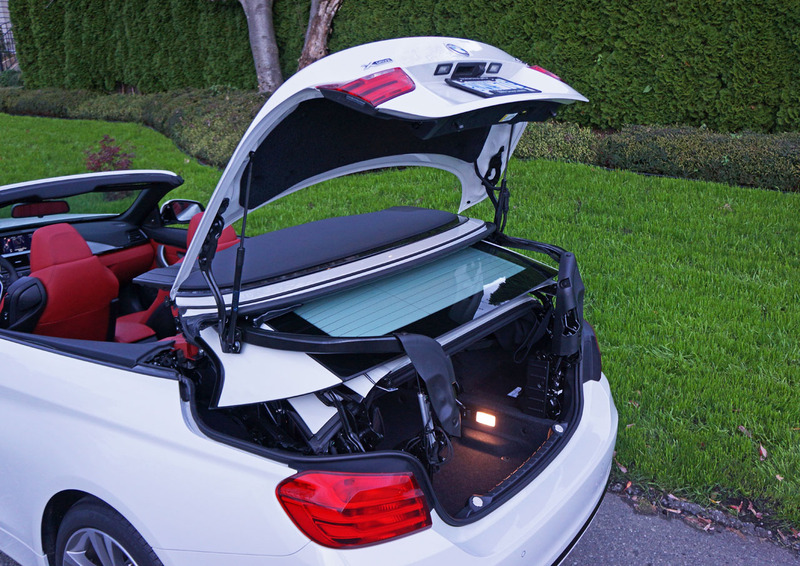 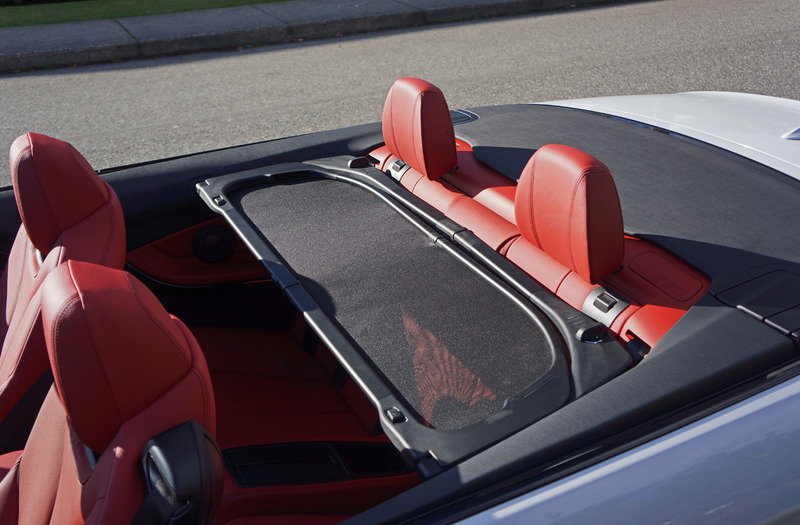 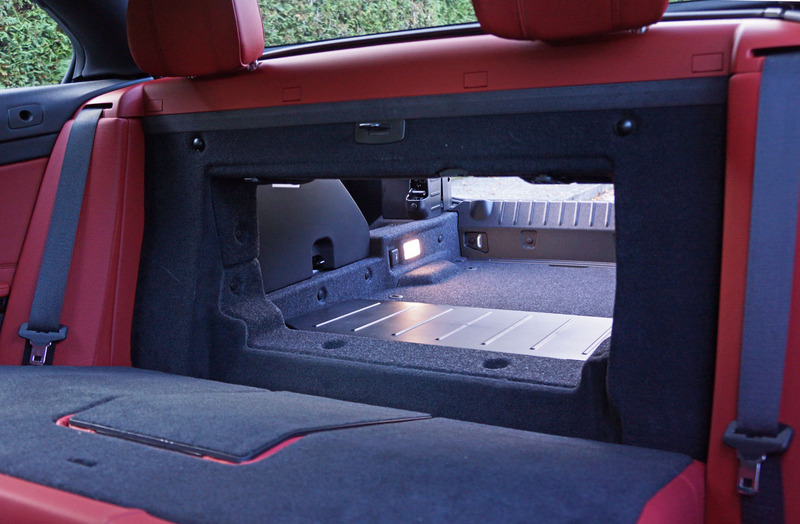 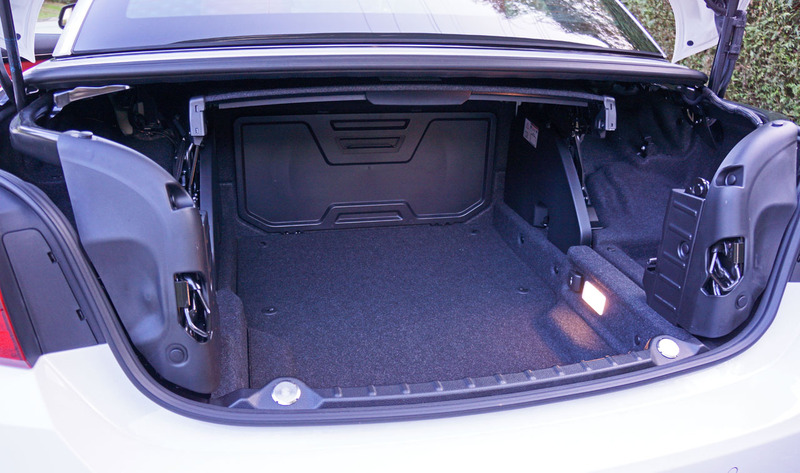 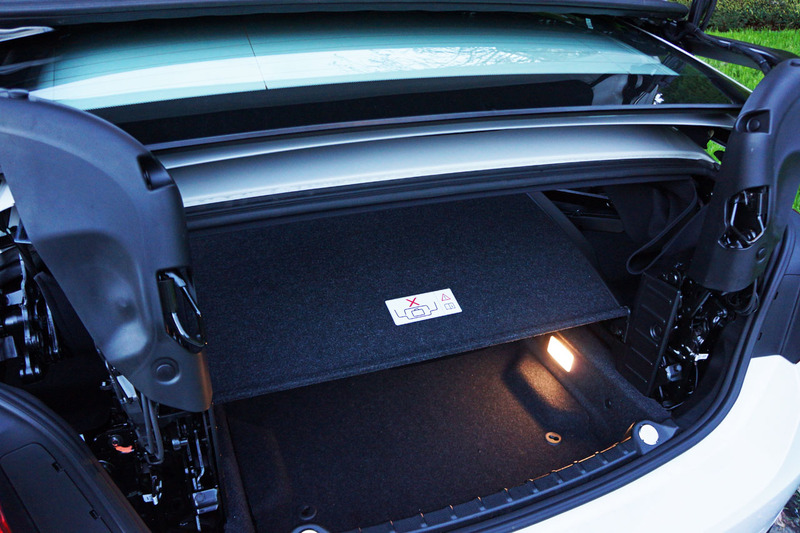 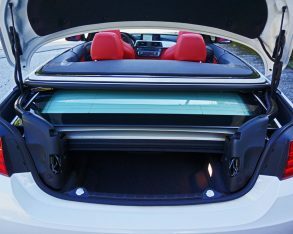 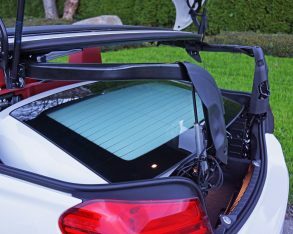 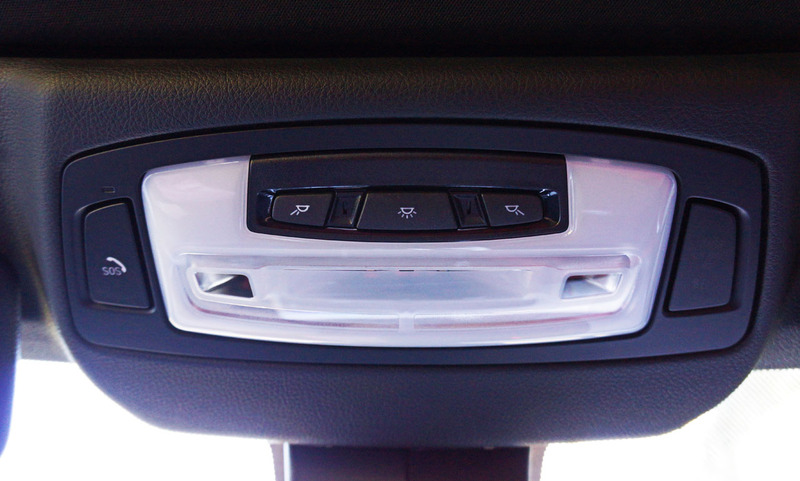 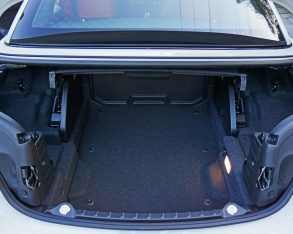 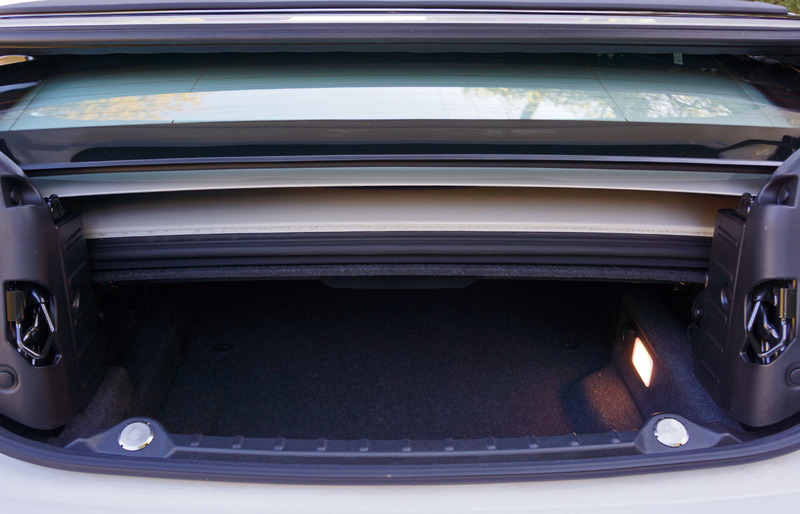 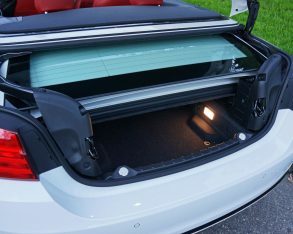 Press and hold a switch on the underside of the trunk lid and it powers up about a foot higher, after which the three roof panels follow suit, thus allowing you to lift up the trunk divider and access your gear. 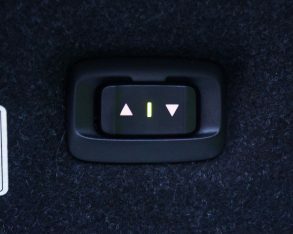 Loading can be done the same way in reverse. 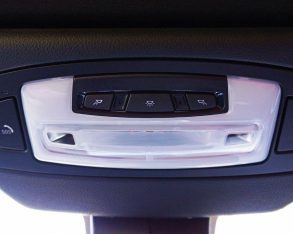 two-in-one system that required four individual steps to open. 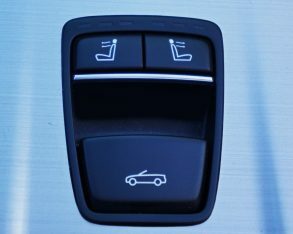 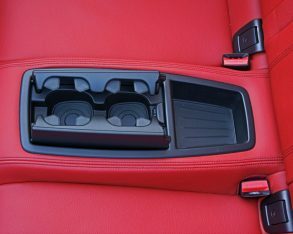 Not quite as complicated but just as interesting, BMW’s current 5 Series comes with a double cupholder system of its own that’s equally bizarre. 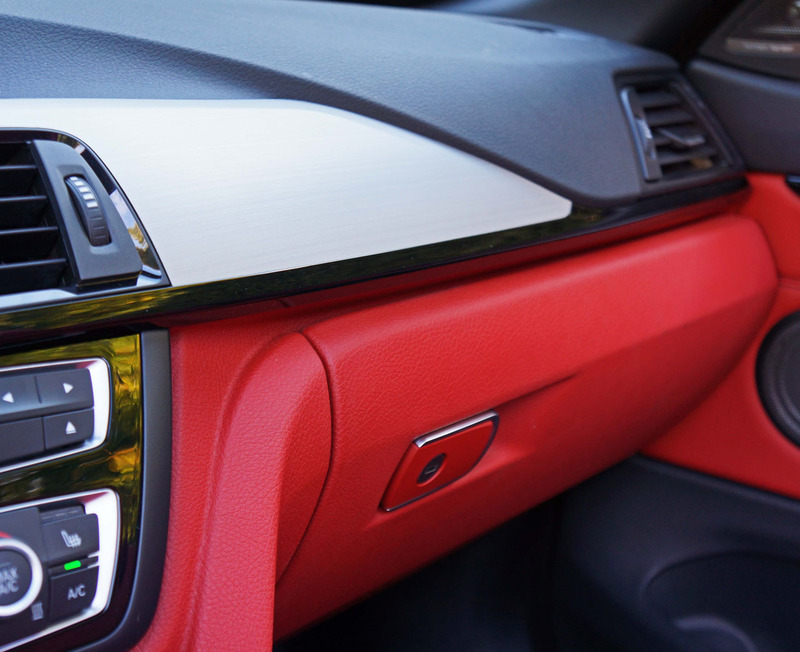 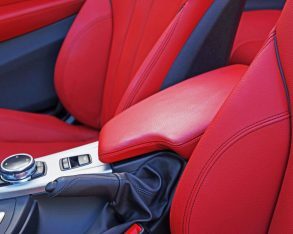 It includes a “half ring” hidden under the passenger-side armrest and a small, shallow hole just ahead of that armrest, both of which will transform into full cupholders after some fancy finagling. 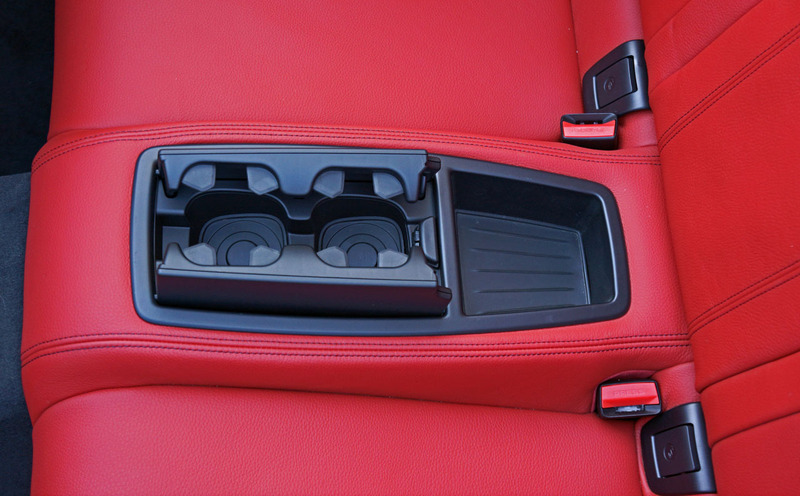 Press down on the forward portion of the front cupholder and an extra retaining ring and spring-loaded support pop up and out to secure almost any sized beverage, while the cupholder just behind requires its half ring to be locked down into position to grab hold of the second cup, bottle or what-have-you, lamentably eliminating the use of the passenger-side armrest in the process. 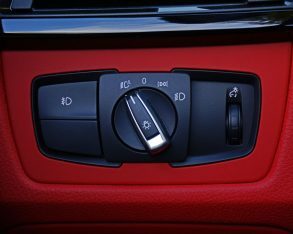 After you’re done, simply pull on the white arrow button and the ring retracts back into place in typically smooth, nicely damped Teutonic precision. 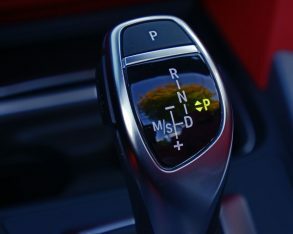 suppose one has to wonder why everything has become so complicated. 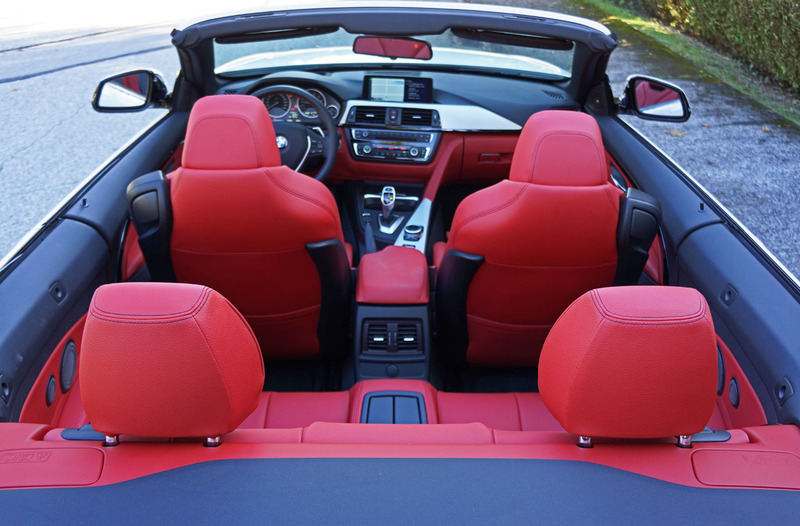 I purchased a brand new 3 Series Cabriolet many years back and was thoroughly satisfied with its complete lack of cupholders and impressively finished cloth top, the latter of which did a fine job of sheltering me from winter’s storms while never giving me a single complain. 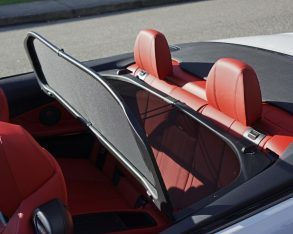 I was one of the few who also bought the optional aluminum roof, but I must admit to not using it on a single occasion. 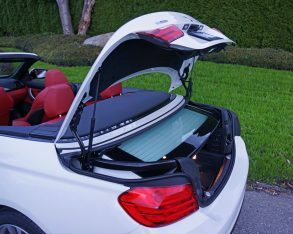 I never showed anyone that shiny black hardtop neatly tucked away in its own protective case, but during a single week with the 428i Cabriolet I wowed a number of my friends with its delightfully complex retractable hardtop and its even more intriguing trunk access system, and for these friends the fact that I showed up in a white BMW drop-top with a red leather interior was exciting enough as it was. 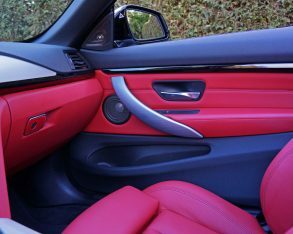 very pretty combination, white being the new silver amongst today’s luxury set and the deep classic Coral Red Dakota hides in my tester always fashionable within a car bearing the blue and white roundel. 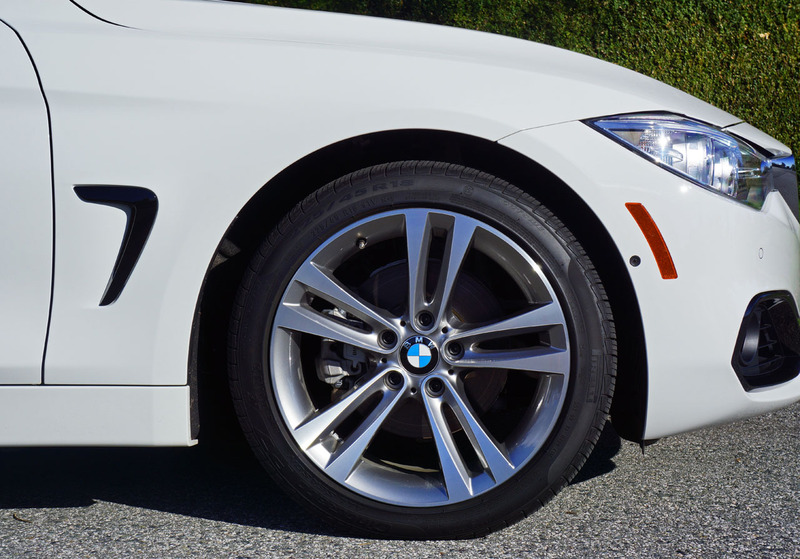 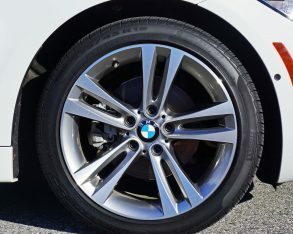 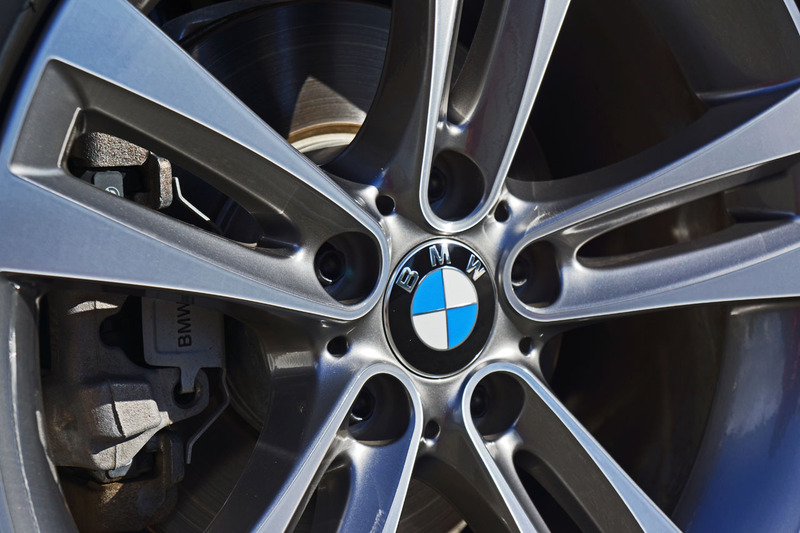 My particular example rode on a stock set of 18-inch double spoke alloys shod in 225/45R18 Pirelli Cinturato P7 runflats, a good tire for providing the performance expected in a BMW and comfort needed in this model’s more luxury-focused trim. 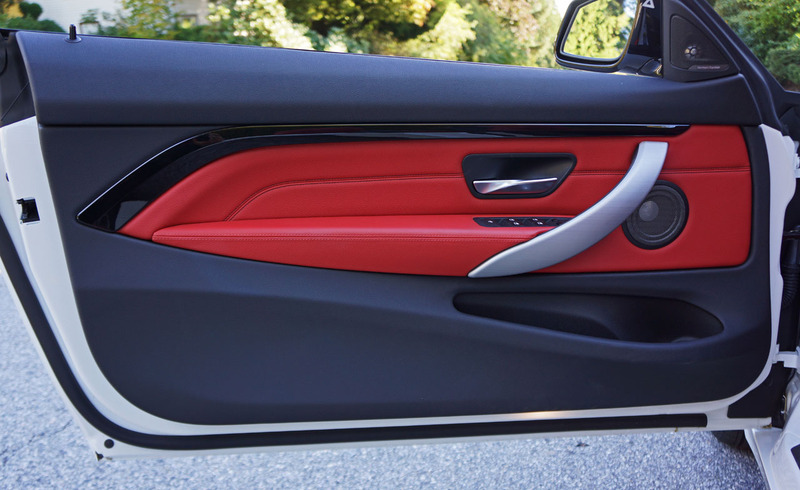 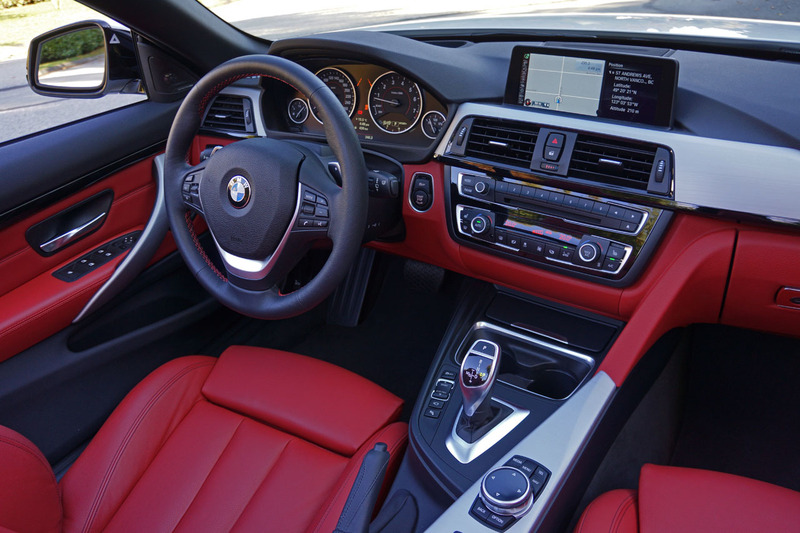 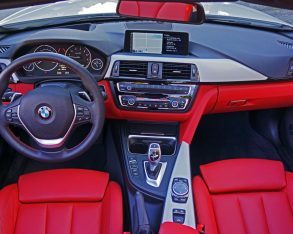 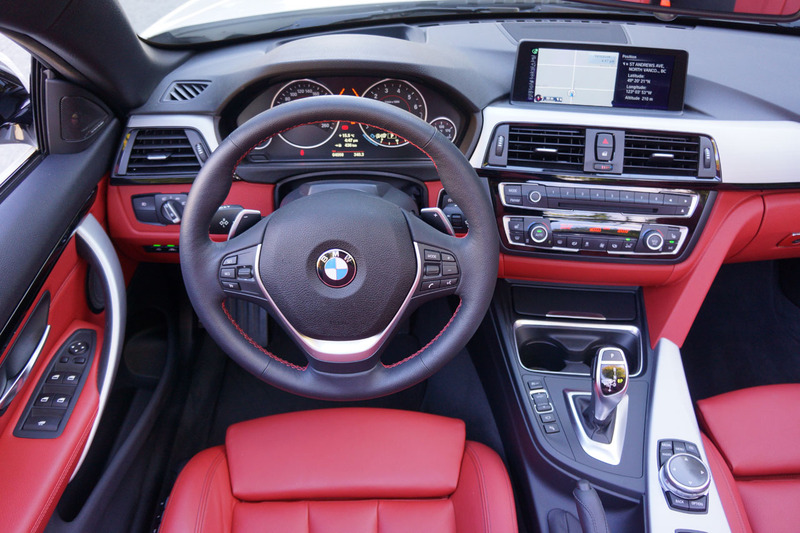 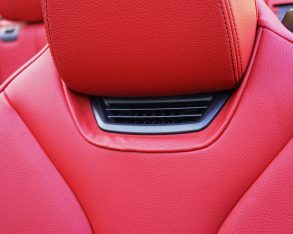 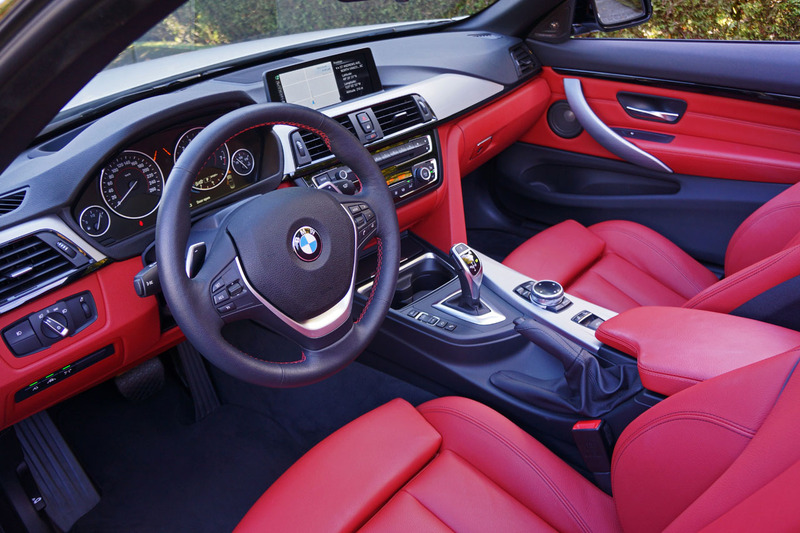 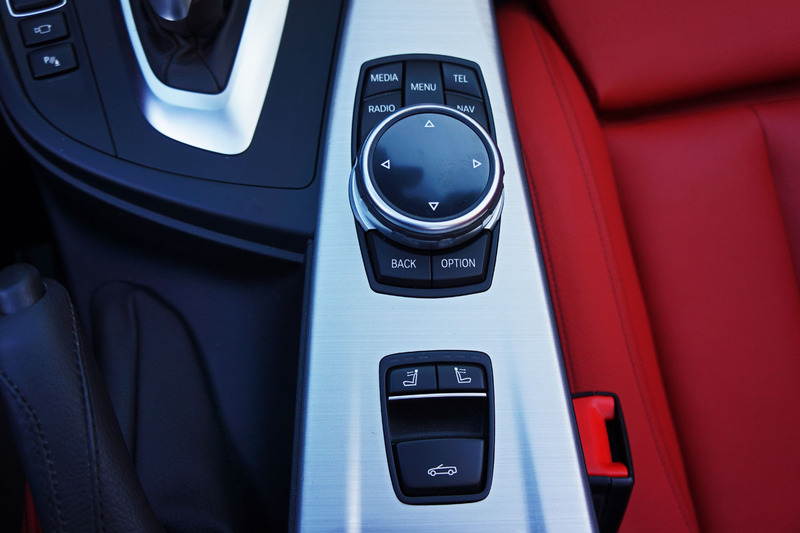 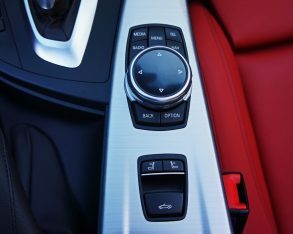 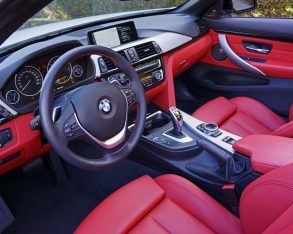 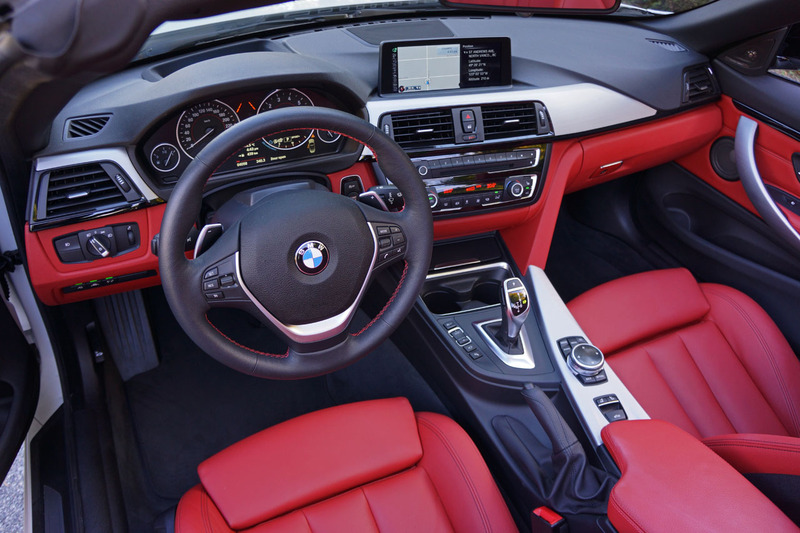 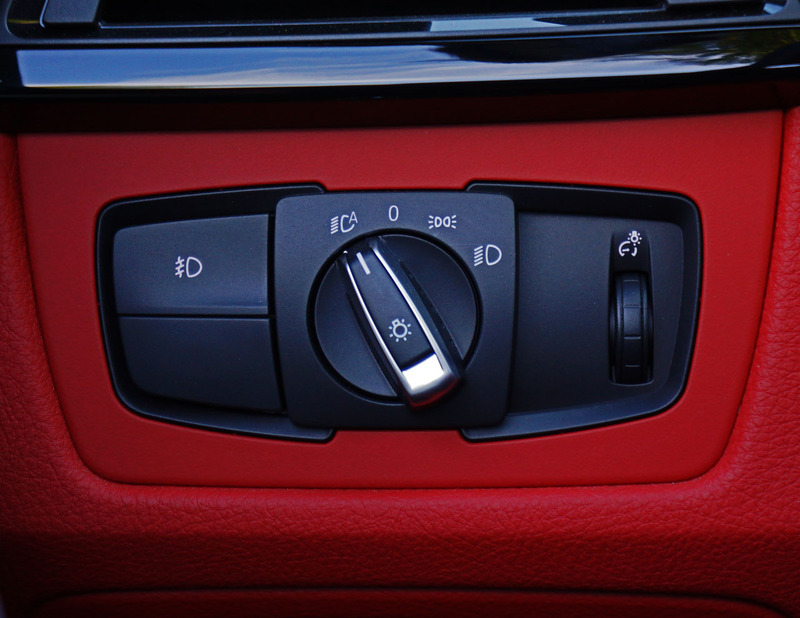 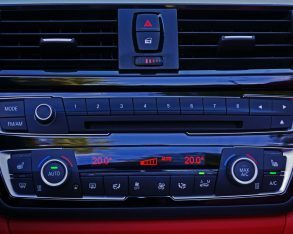 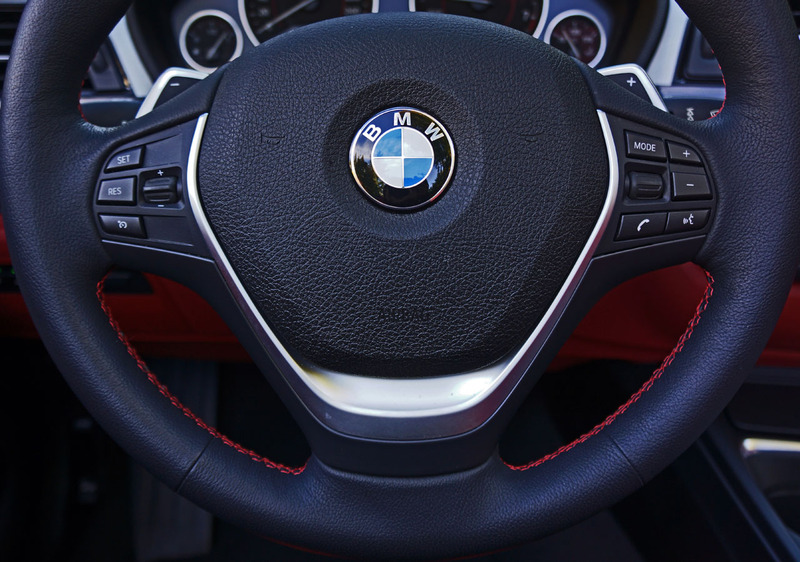 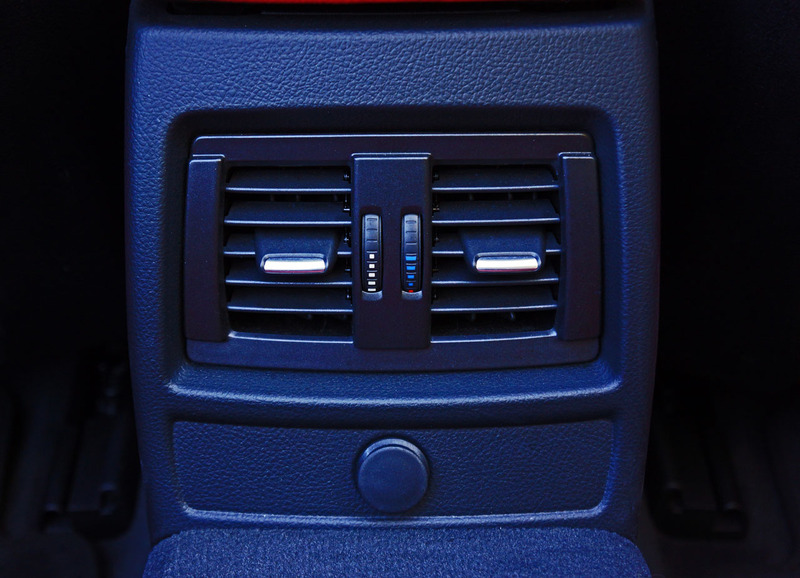 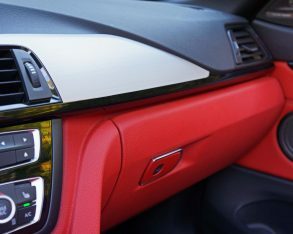 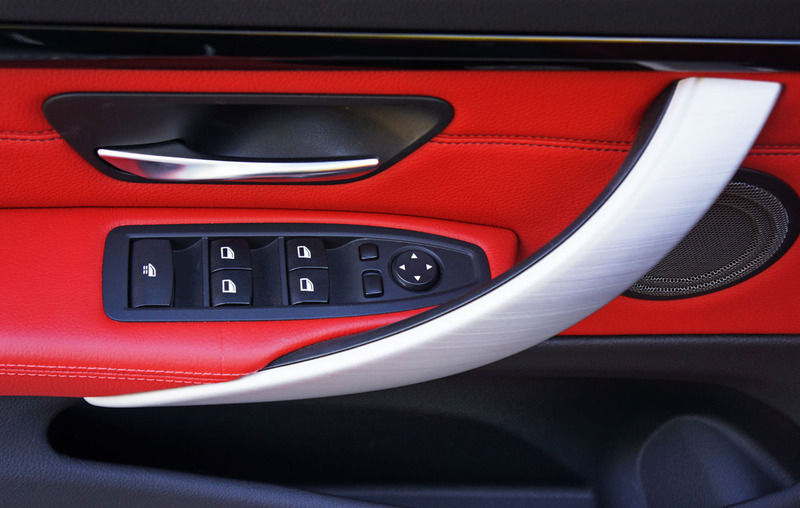 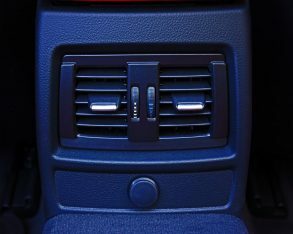 Speaking of trim, BMW kept the interior accents stock, which is to my liking as the finely brushed aluminum added to the sophisticated look, a nice complement to the Coral Red lower dash and door inserts, as well as the sporty red stitching on the steering wheel. 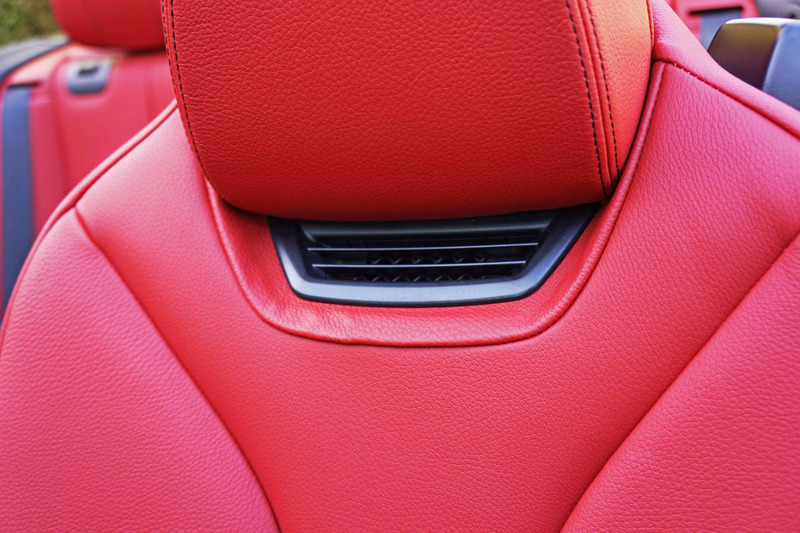 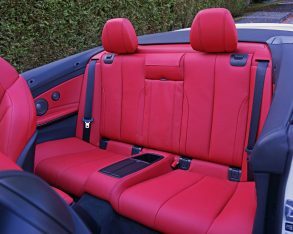 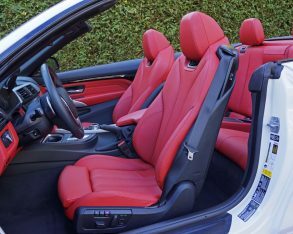 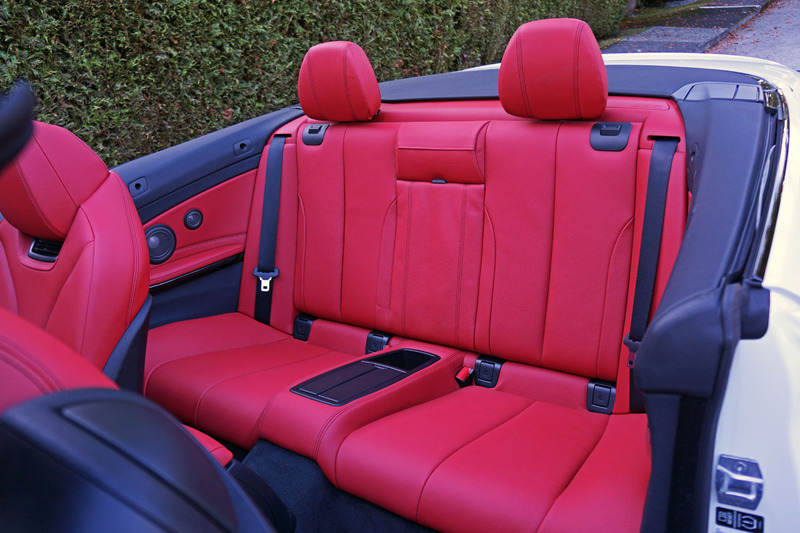 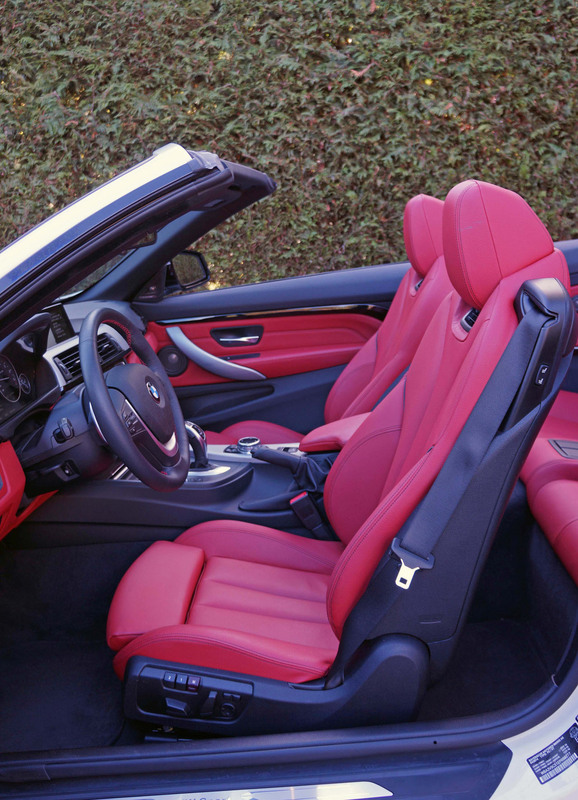 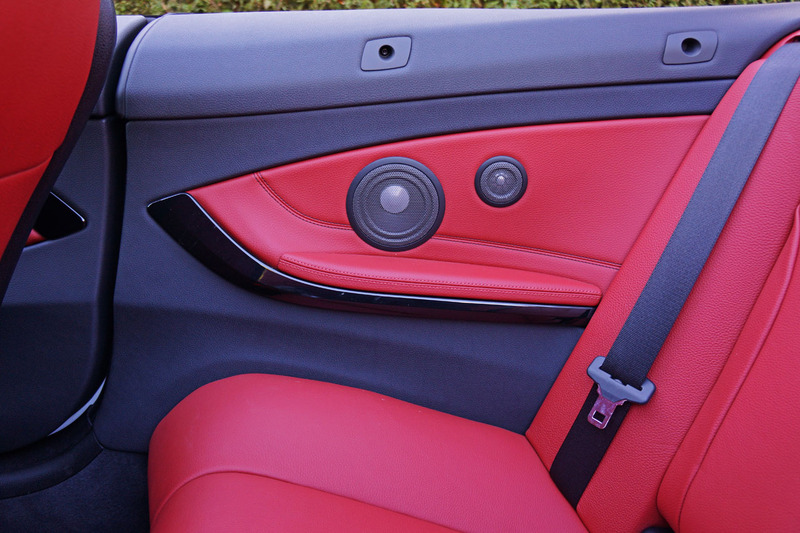 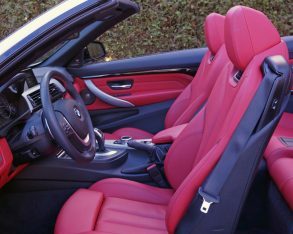 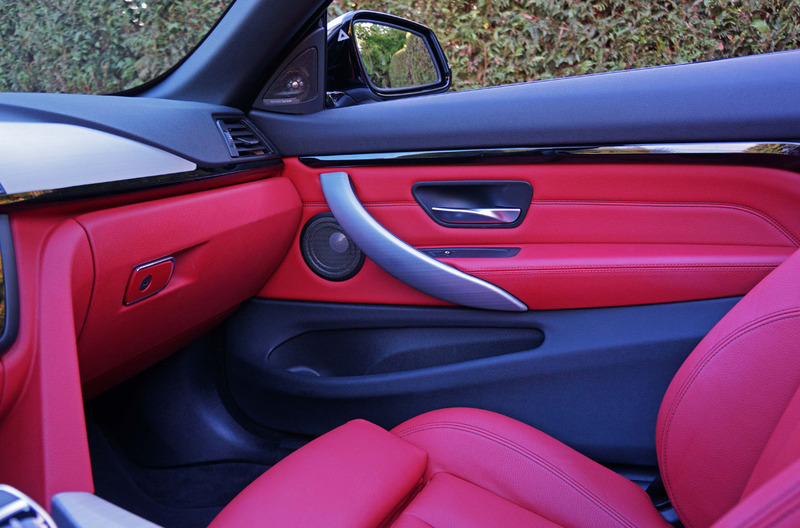 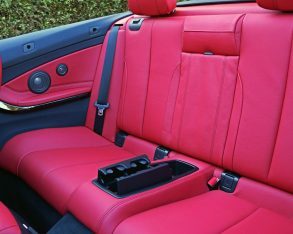 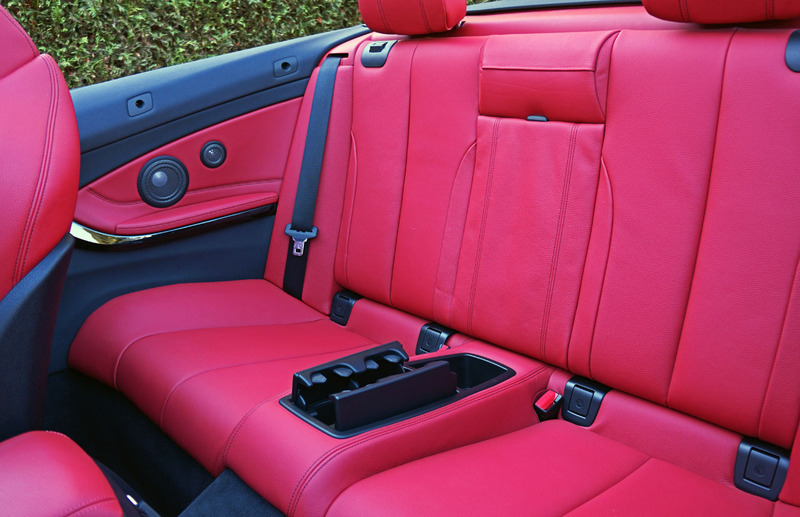 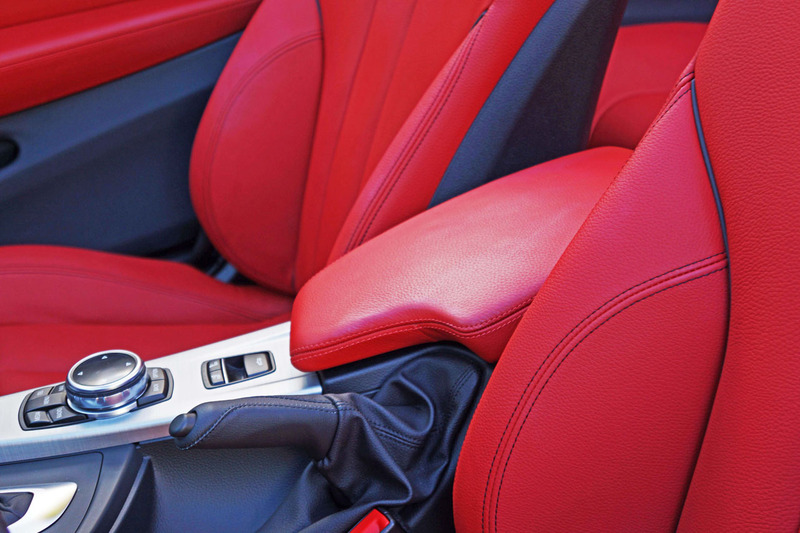 The seats were stitched in black, providing the perfect contrast to their red leather. 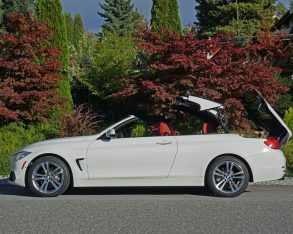 All in all my 4 Series Cab looked even grander than the sixty-plus grand needed to purchase it. 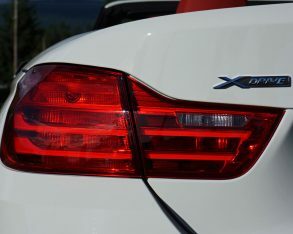 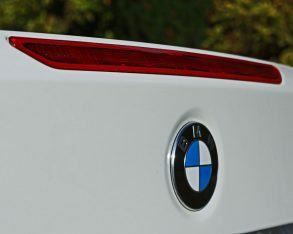 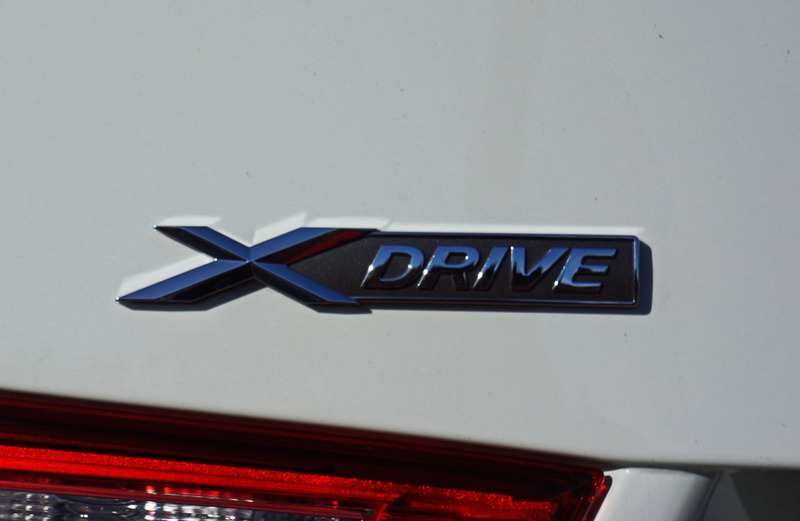 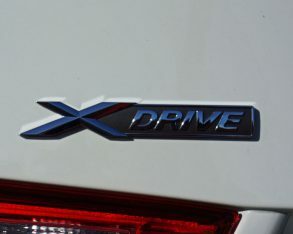 sticker on the window of a base 4 Series Cabriolet would otherwise read $58,200, plus $2,095 for freight and pre-delivery prep as well as various smaller charges, taxes, etcetera, whereas xDrive adds $1,700 to the bill for a starting price of $59,900. 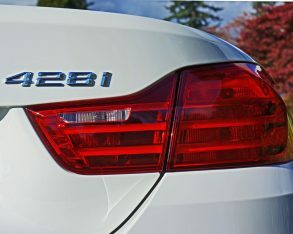 All-wheel drive is only available with the 428i designation, the 435i Cabriolet remaining rear-wheel drive only for the time being. 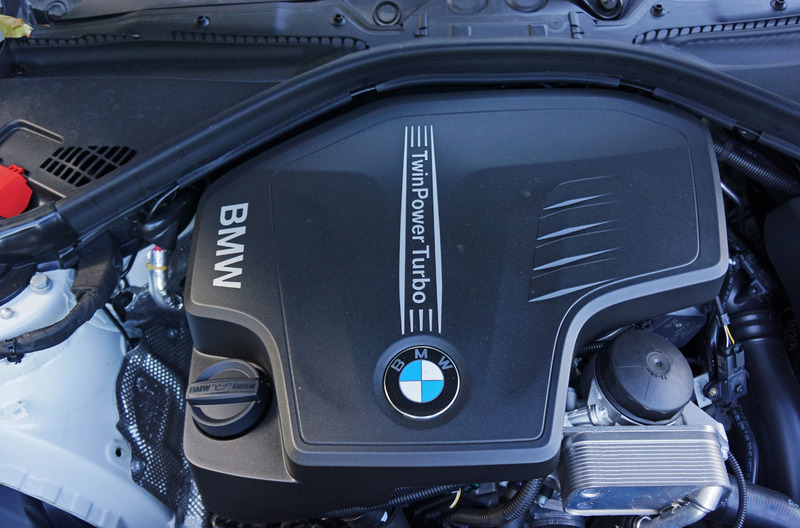 horsepower available between 5,000 and 6,500 rpm and an even stronger 258 lb-ft of torque that arrives and stays at maximum twist all the way from 1,450 to 4,800 rpm, for one of the most tractable four cylinder engines in the business. 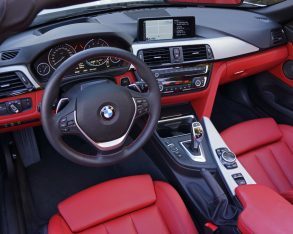 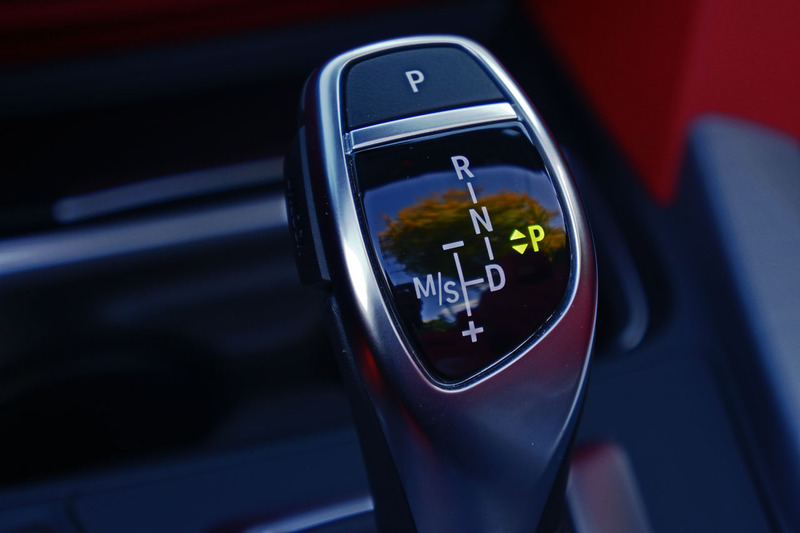 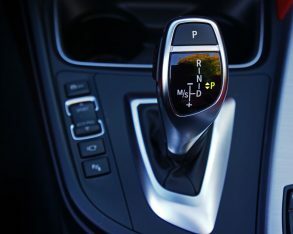 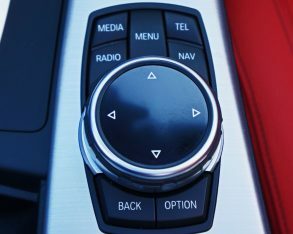 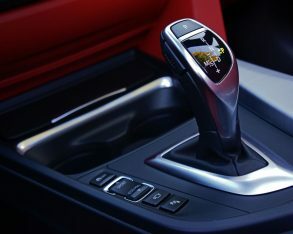 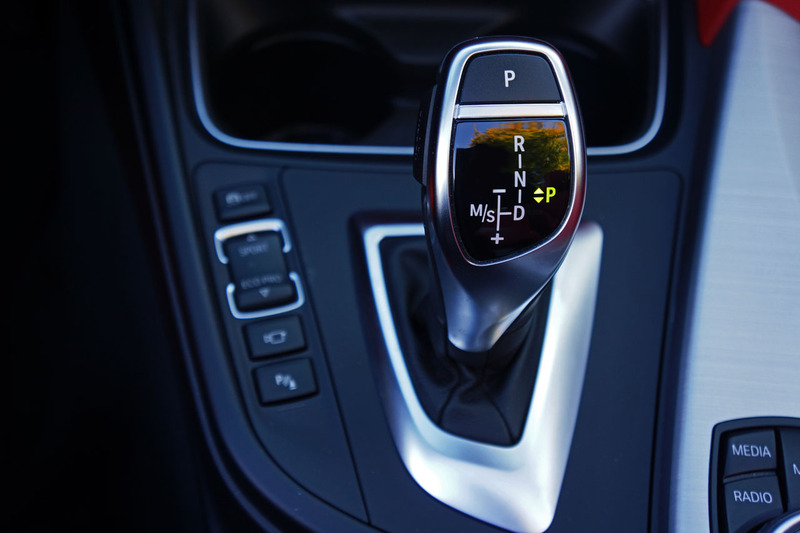 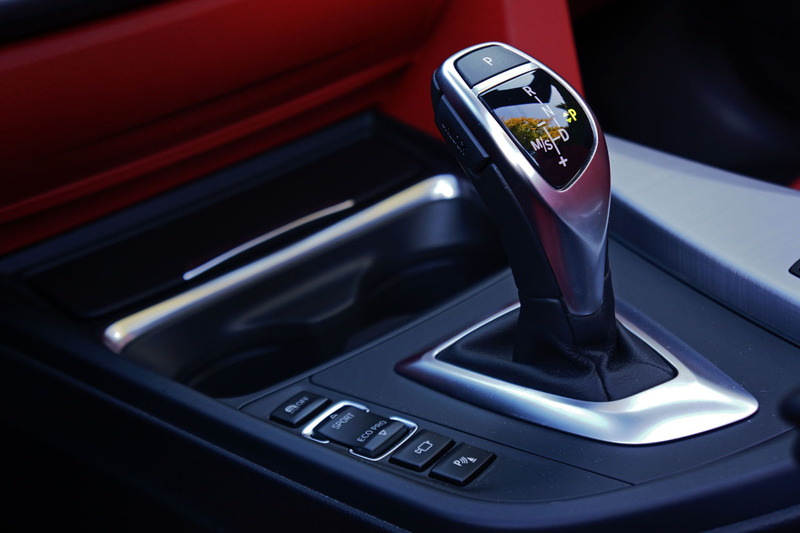 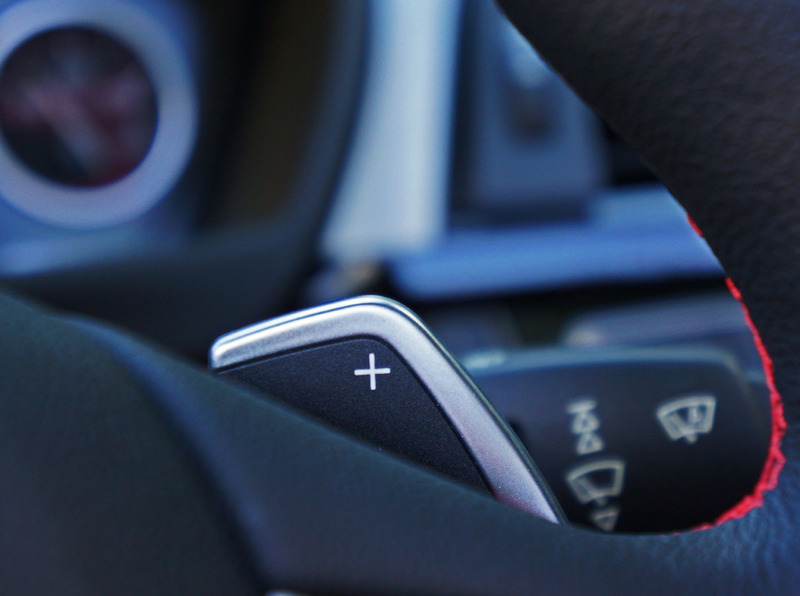 It comes mated to a lightning quick-shifting eight-speed automatic transmission with steering wheel-mounted paddles that’s so good it almost has me forgiving BMW for not offering the car with a manual transmission. 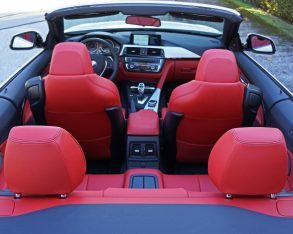 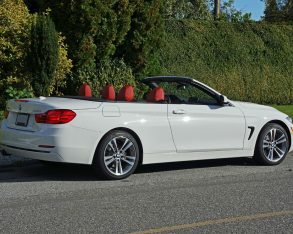 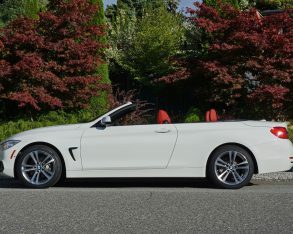 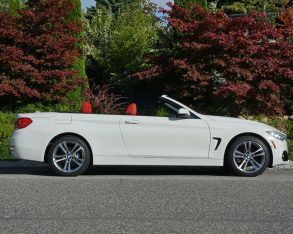 Then again if they sold enough manuals in previous convertibles no doubt one would be available now, so you’ll need to opt for the upcoming 2015 M4 Cabriolet to get your hand on a good old stick shift. 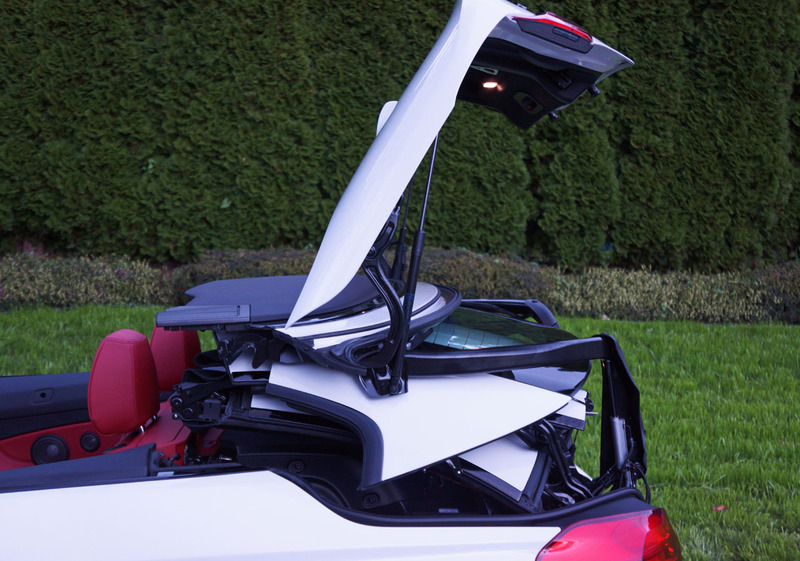 energetic from standstill than the fixed roof car. 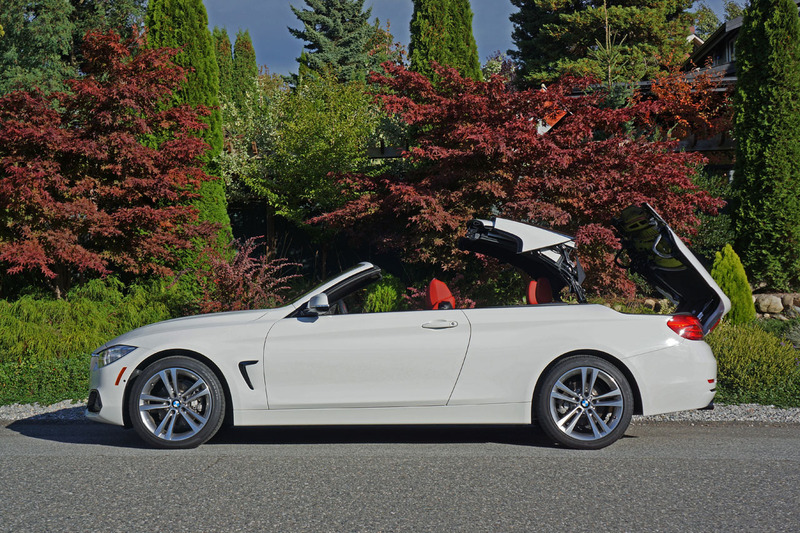 My 428i xDrive Cabriolet tester weighed in at a surprising 1,887 kg (4,160 lbs); no doubt affected by the retractable hardtop I weighed in on before. 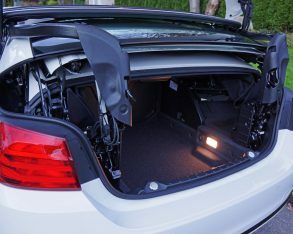 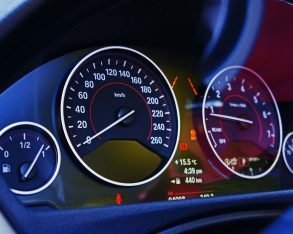 The result is a zero to 100km/h sprint time of 6.5 seconds compared to 5.9 for the Coupe, a difference that can easily be felt by the seat of the pants. 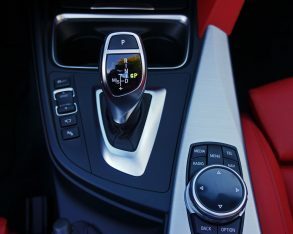 Still, for those odd moments when you need to get away quickly, 6.5 seconds feels plenty quick, its Sport mode-enhanced autobox snipping away shifts in perfectly synced systematic succession whether left to its own devices in Drive or via those paddles I mentioned a minute ago, which are beautifully crafted from aluminum with nice tidy little leather fingertip pads. 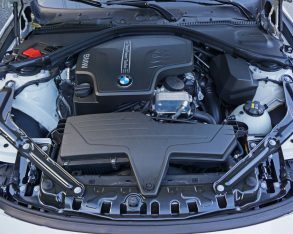 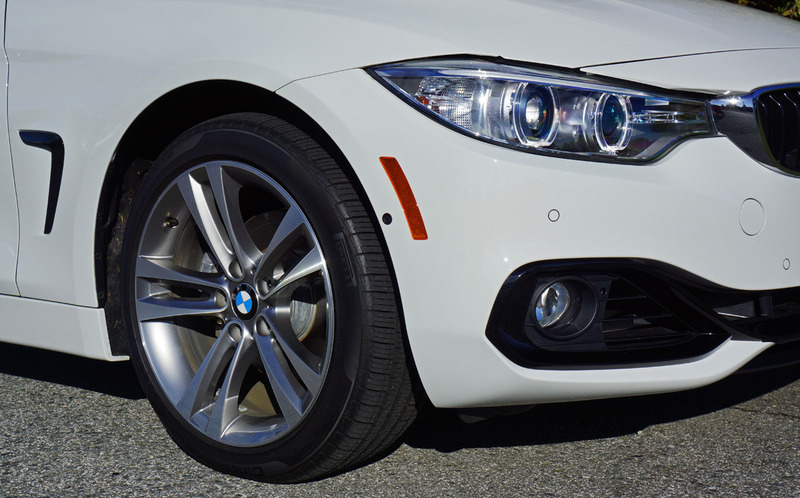 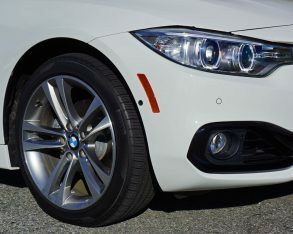 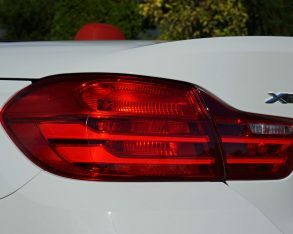 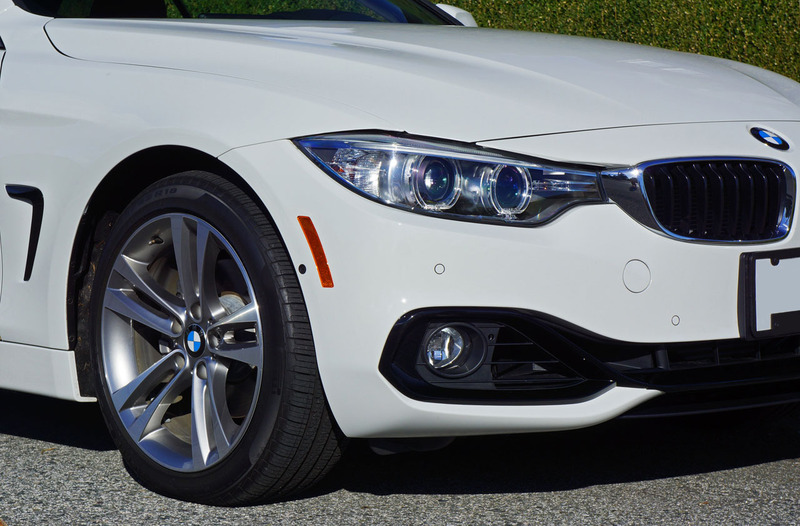 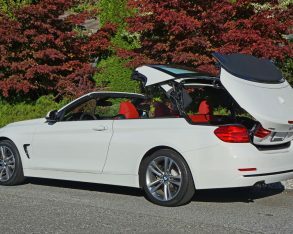 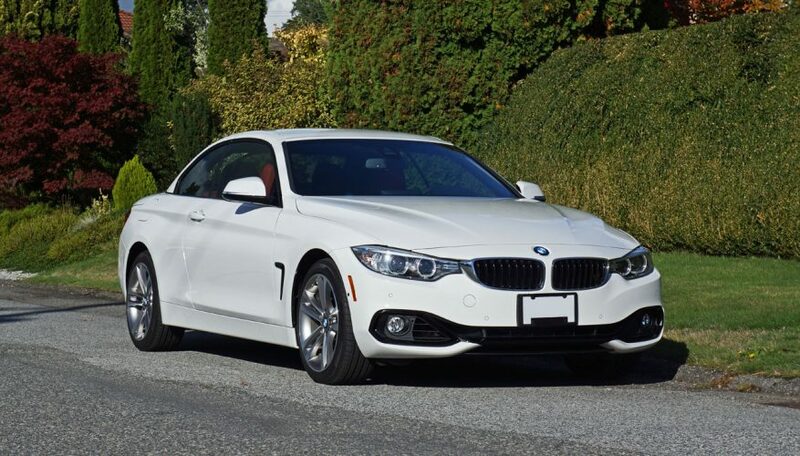 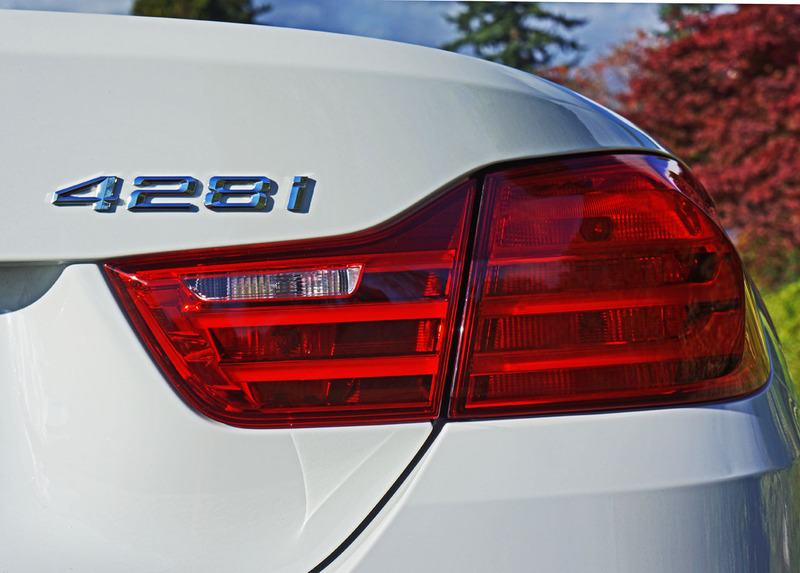 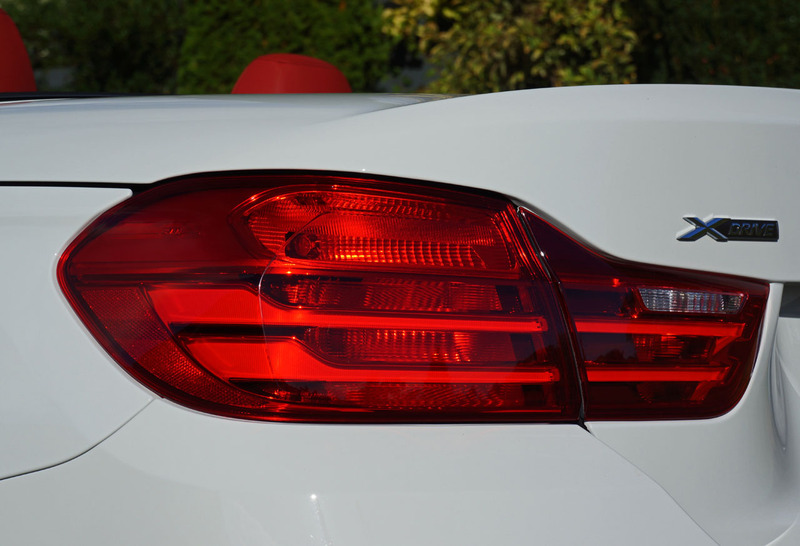 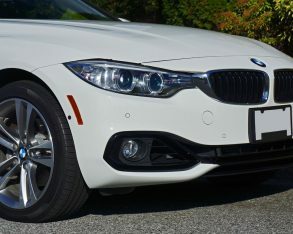 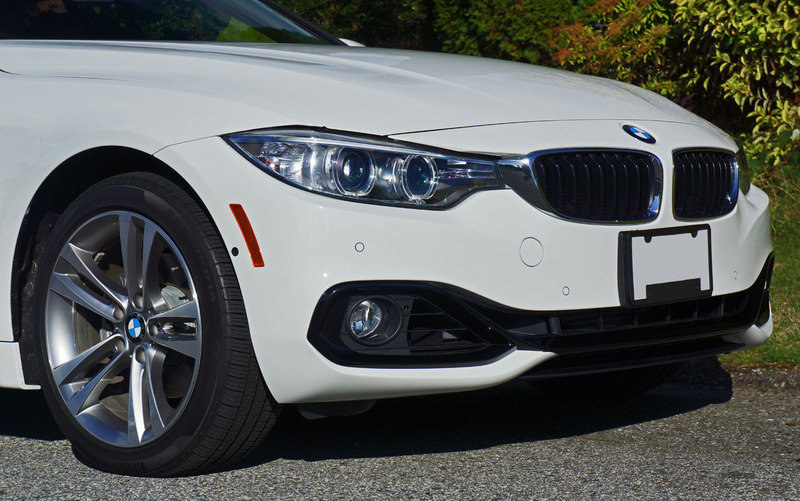 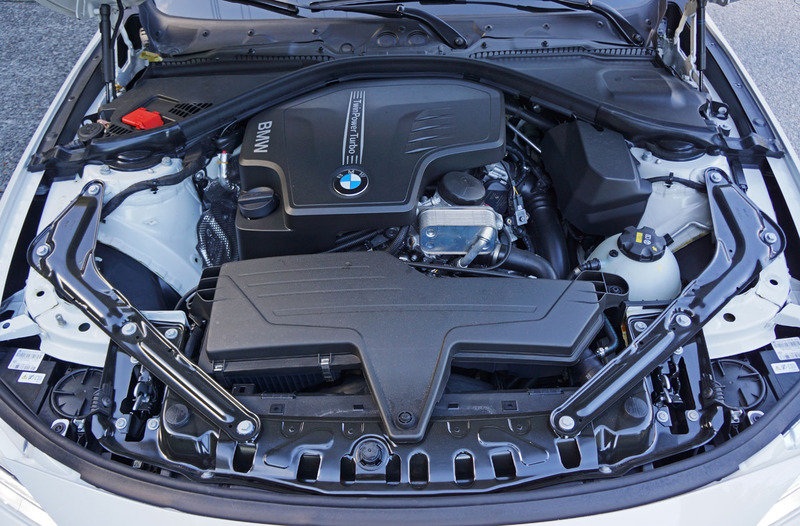 up to the 300-horsepower 435i Cab if you want to set a quicker pace, or at least add the $1,700 Performance Package with its variable sport steering system, M Sport suspension upgrade, and 19-inch rims to the 428i. 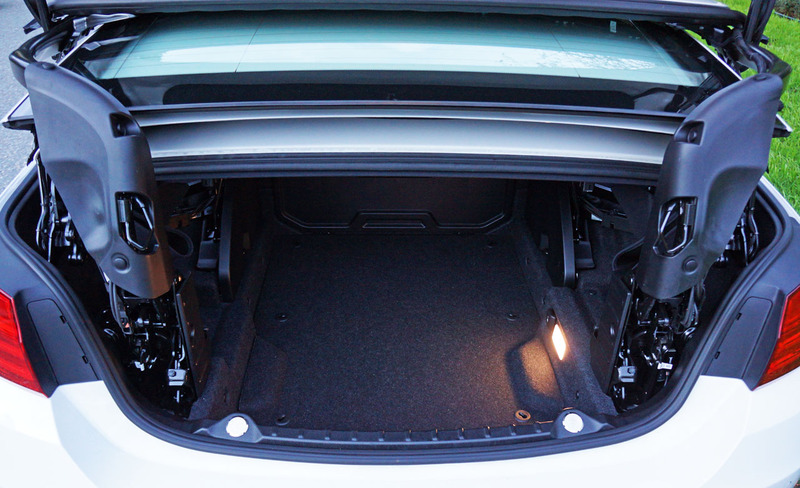 I’m guessing my base tester’s undercarriage was as capable through the corners as most peoples’ taste requires. 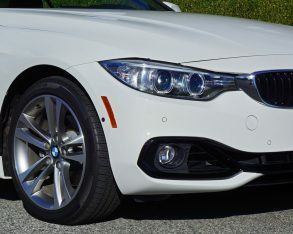 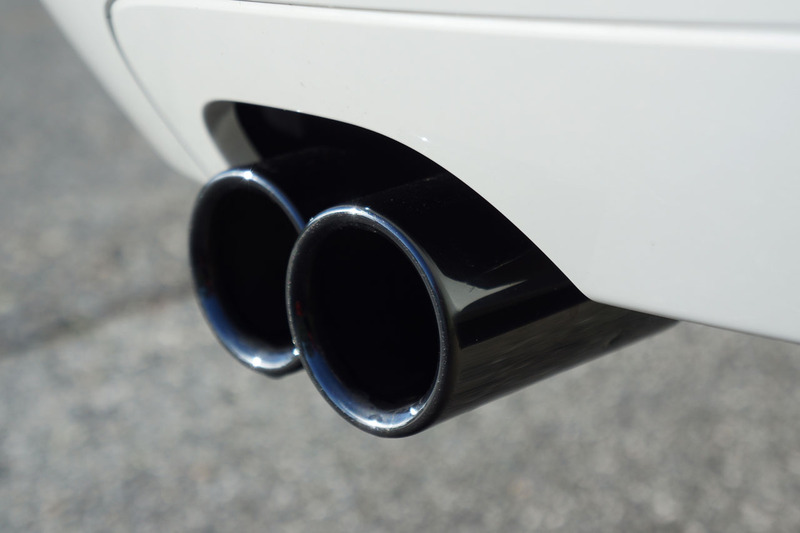 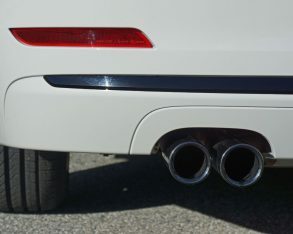 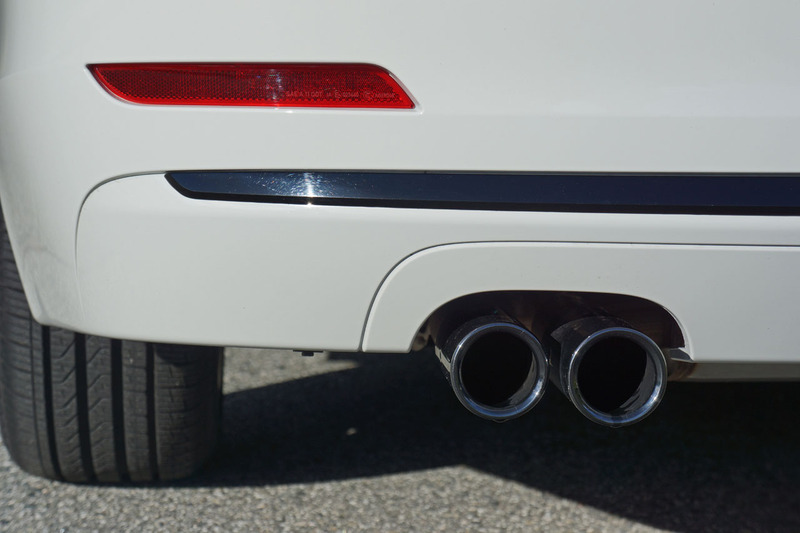 Thanks to a body structure that achieves 40 percent more torsional rigidity than the old 3 Series Cabriolet, BMW was able to soften up the suspension a tad more can than it would otherwise need to be in order to deliver the same cornering prowess. 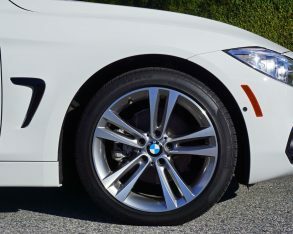 So while it rolls a tiny bit more into fast-paced corners it was more comfortable over rougher uneven and potholed pavement, an appreciated asset by most peoples’ standards. 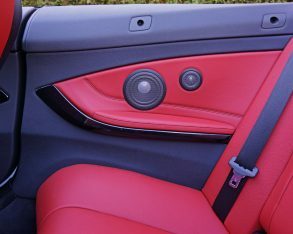 at collar height to keep your neck cool in the summer and warm in winter’s chill, as well as powered lumbar support for that aching back, a fabulous Harmon/Kardon surround sound system for soothing tired aching ears, head-up display for keeping aching bloodshot eyes on the road, and a universal remote for getting your 428i Cab back in the garage and your aching old body into bed faster. 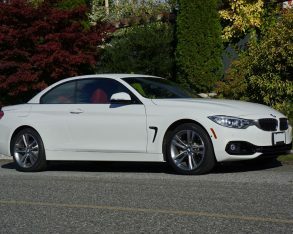 OK, before this review turns into an autobiography about how I’m really starting to feel as winter rears its foreboding face, I must admit the 428i Cab’s three-way heated standard sport seats are wonderfully comfortable and totally supportive in all the right places, exactly what my overworked frame needed during a long workweek while enduring fall’s chillier temperatures. 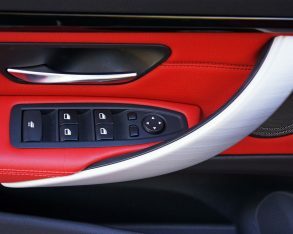 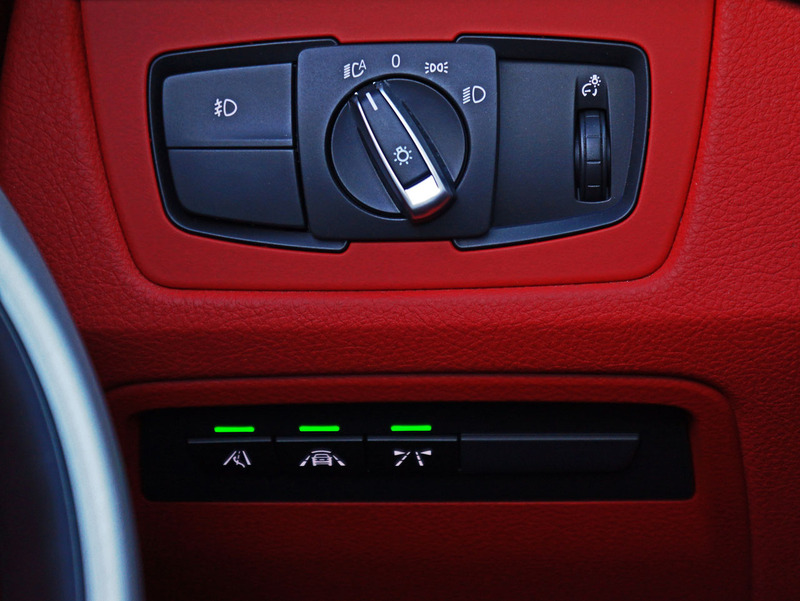 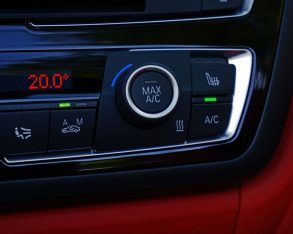 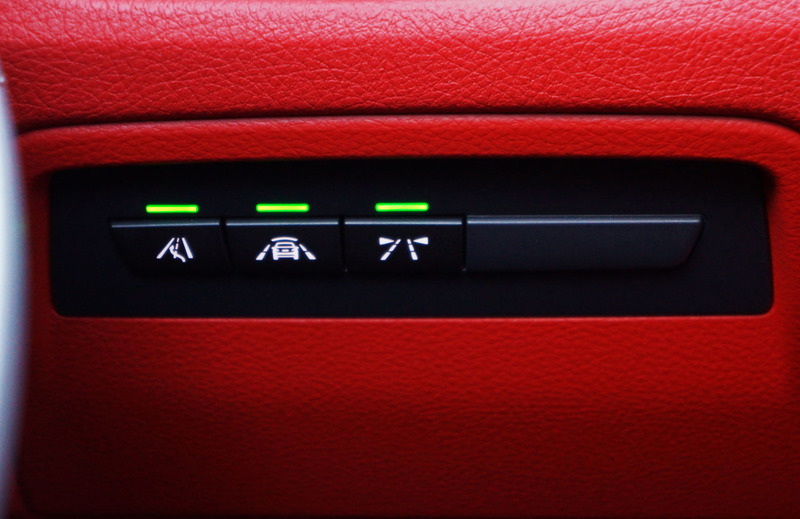 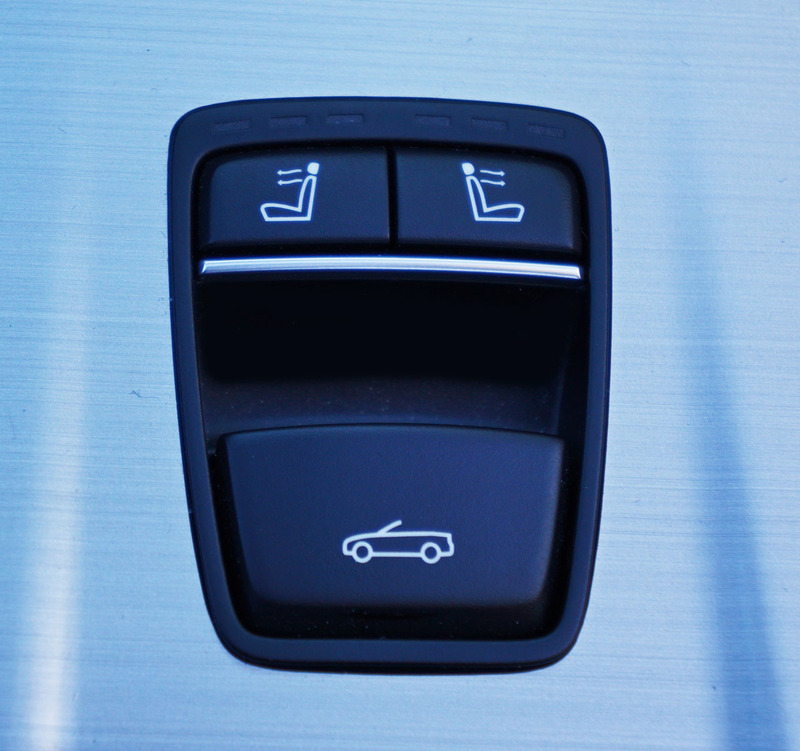 system, plus proximity sensing Comfort Access to go along with its standard pushbutton ignition, a comfy heated steering wheel, auto-dimming side mirrors to along with the auto-dimming mirror already at centre, satellite radio, a rearview camera, front and rear parking sonar, an alarm system, and a one-piece folding rear seatback for extending the usefulness of the abbreviated trunk. 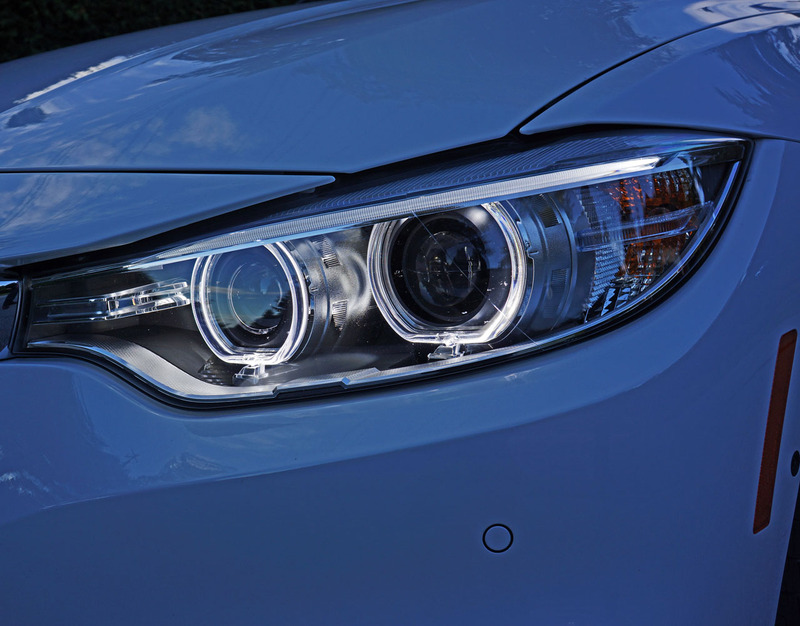 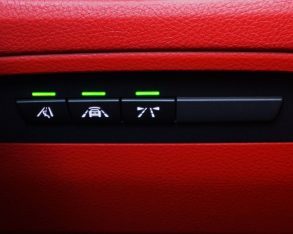 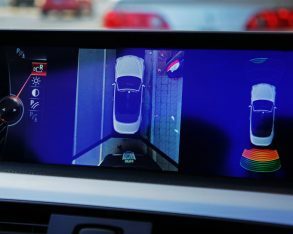 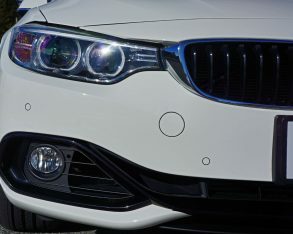 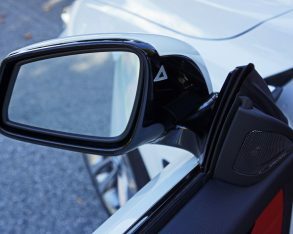 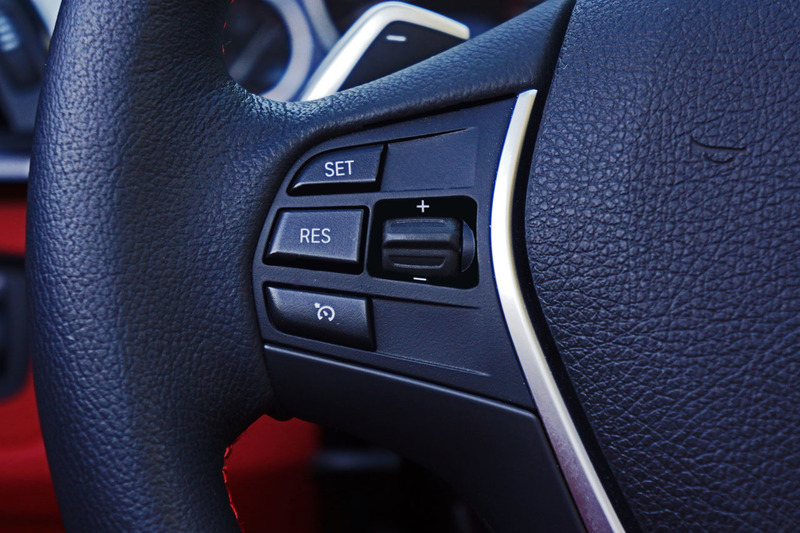 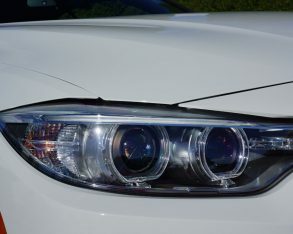 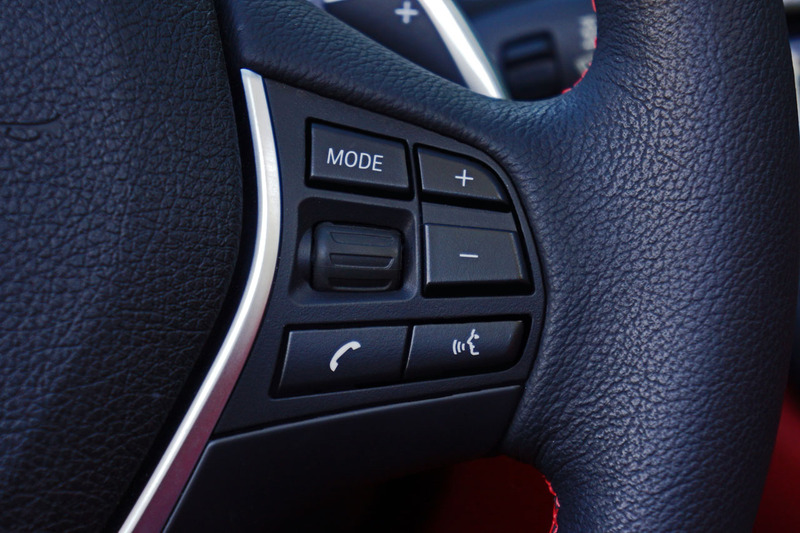 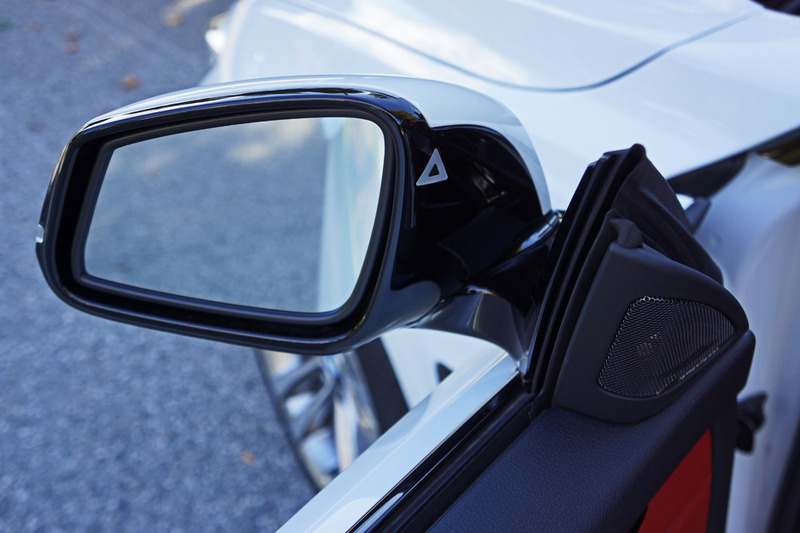 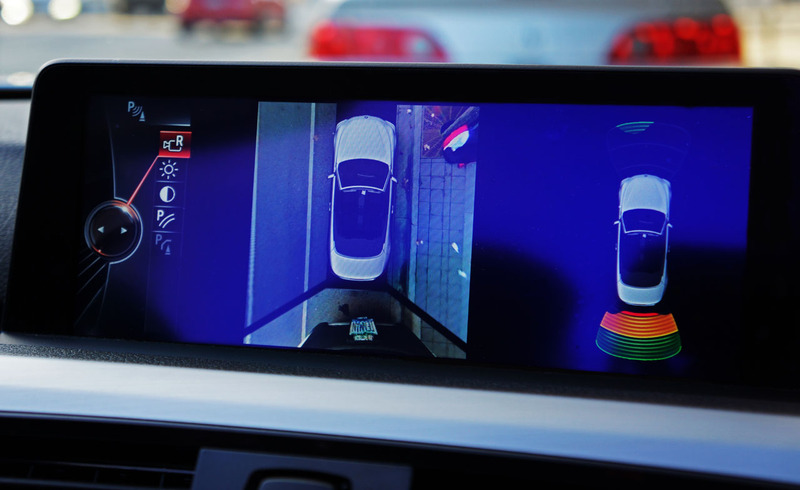 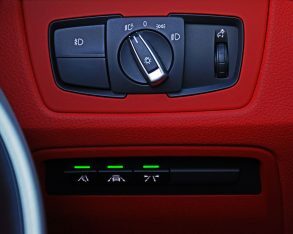 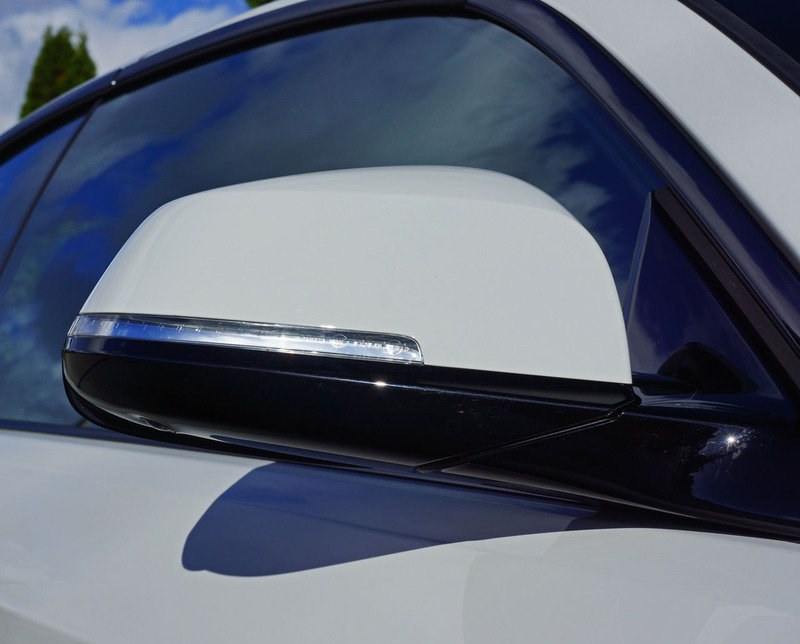 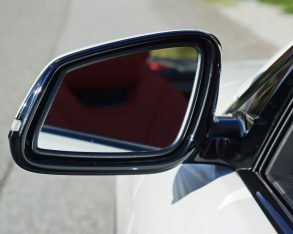 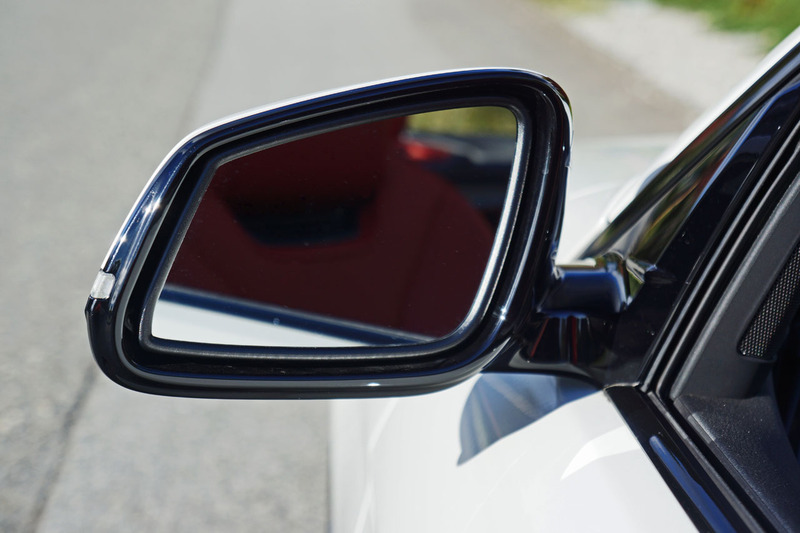 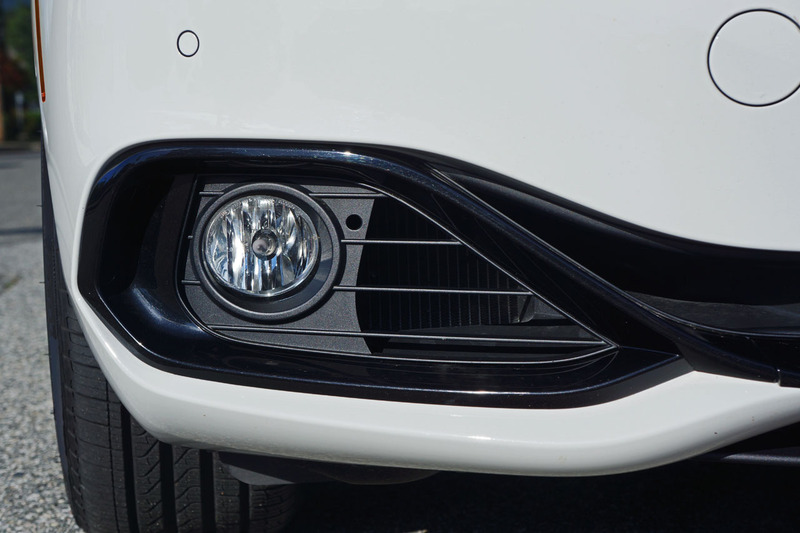 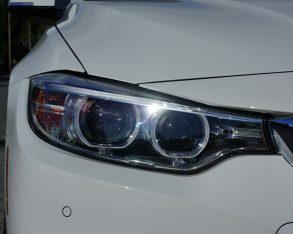 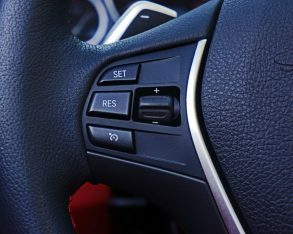 Additionally, the $1,250 Driver Assistance Package added a surround-view parking monitor while deleting the aforementioned rearview camera, along with active blind spot detection plus lane departure and collision warning. 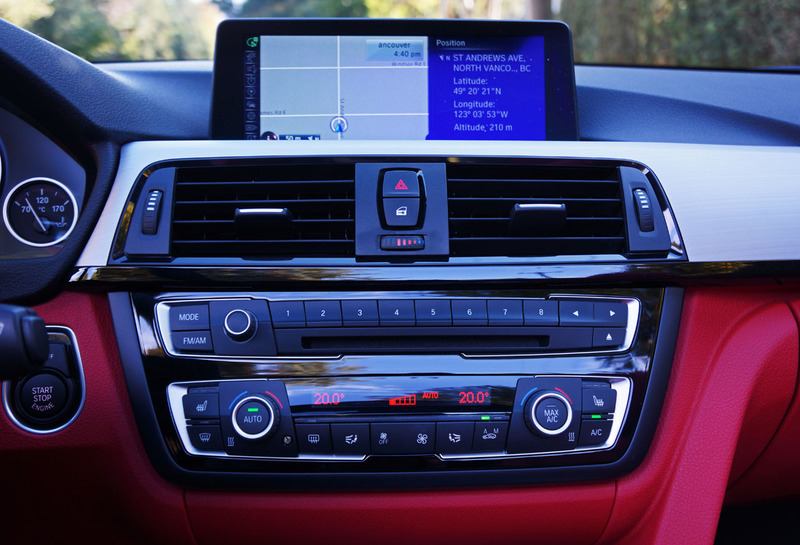 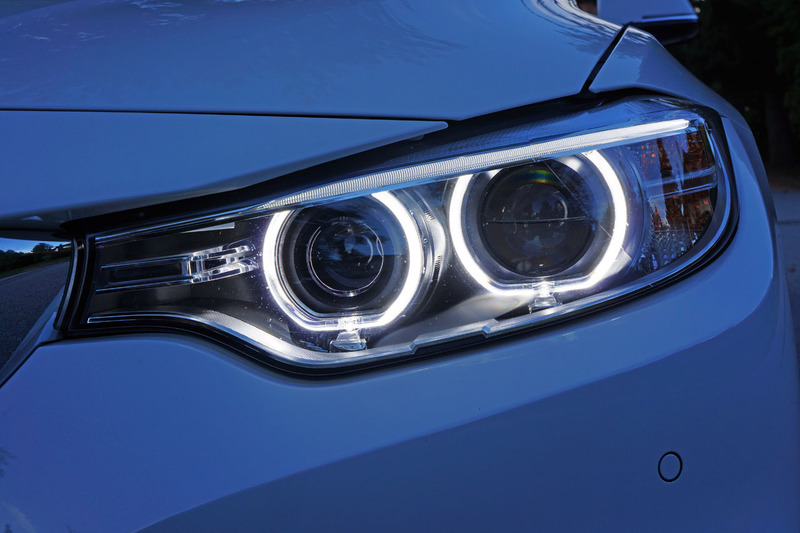 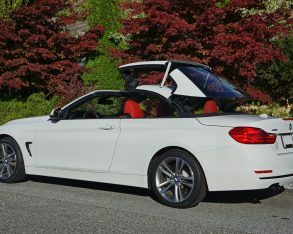 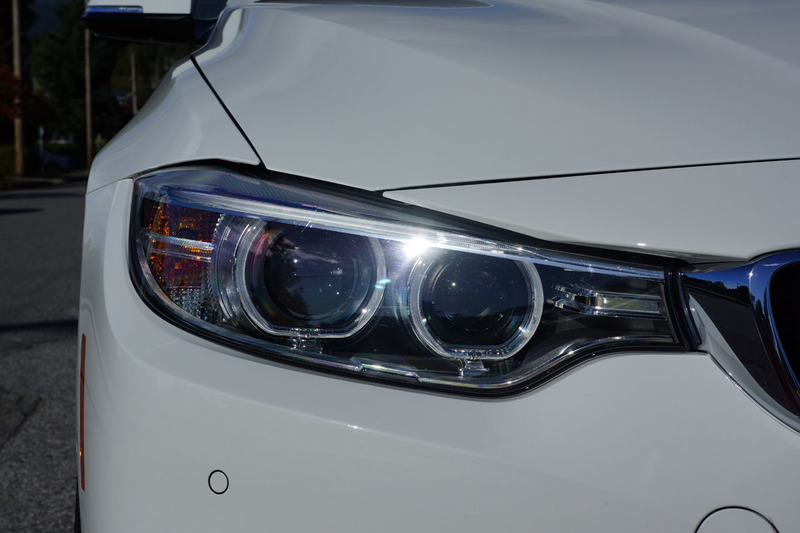 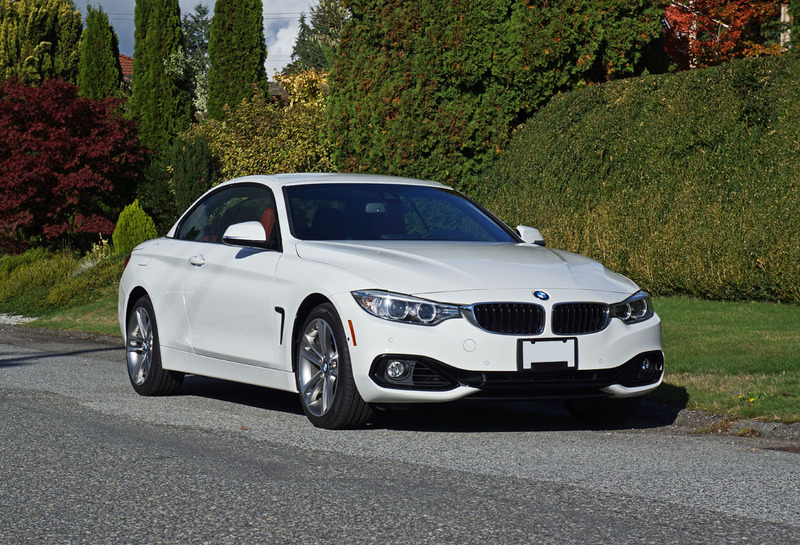 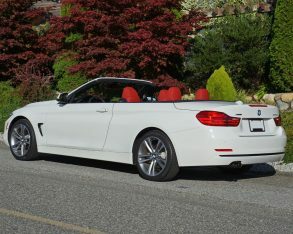 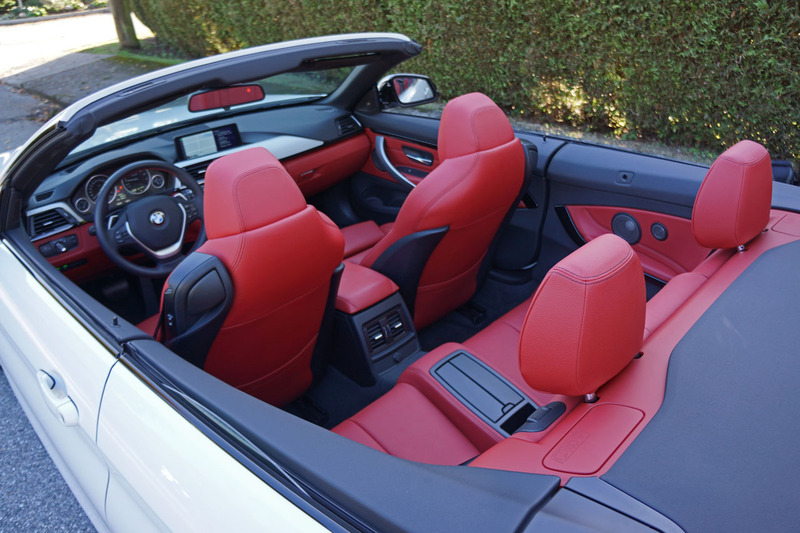 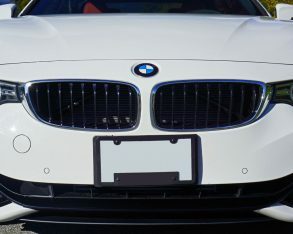 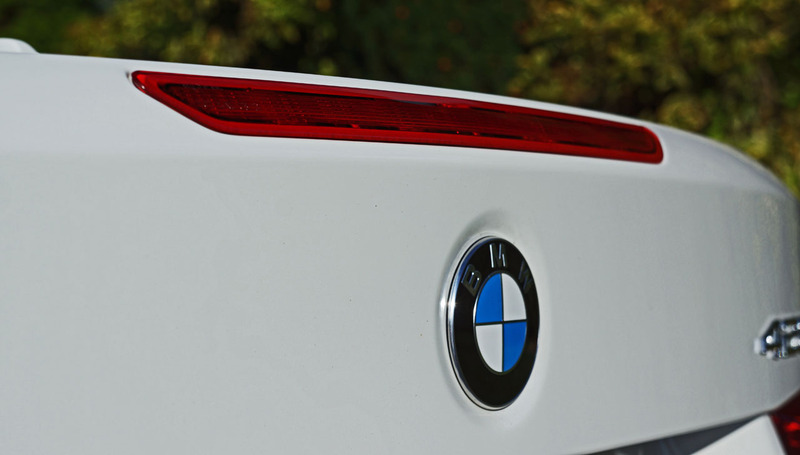 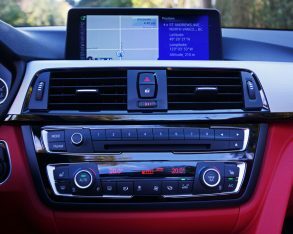 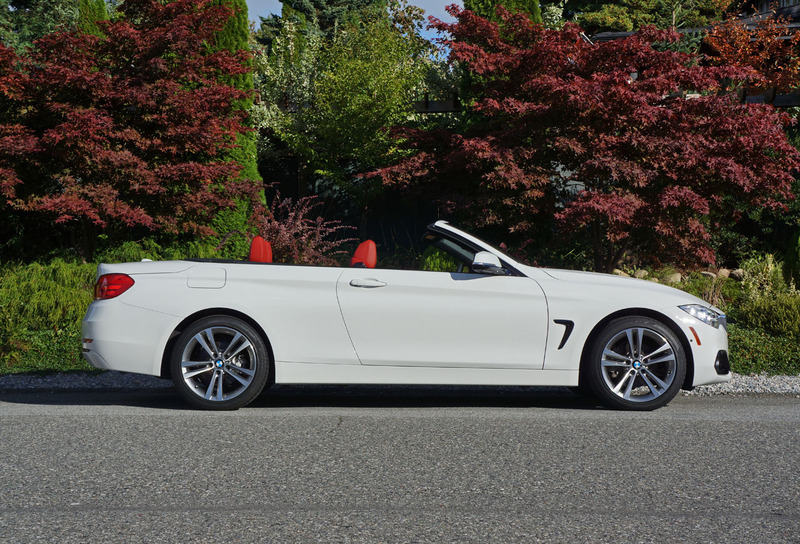 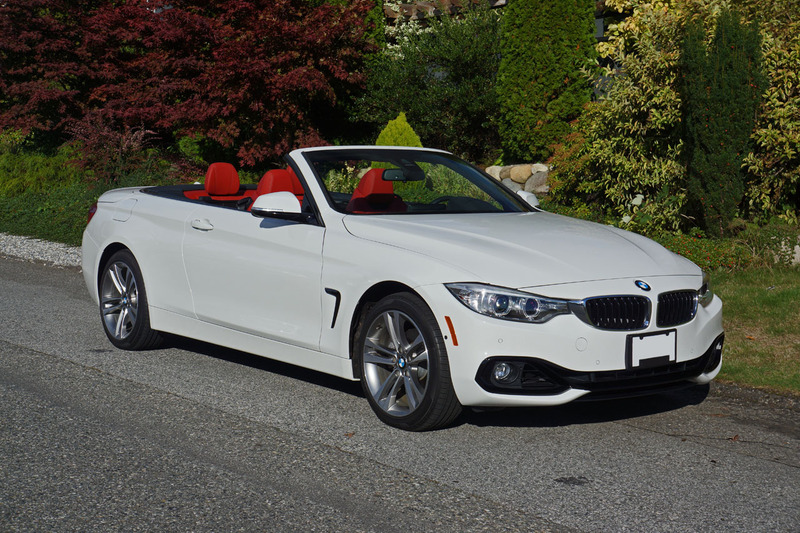 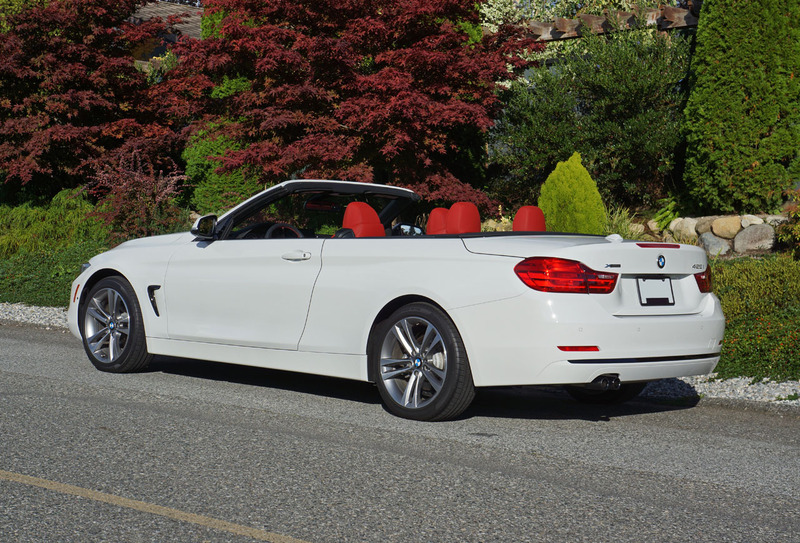 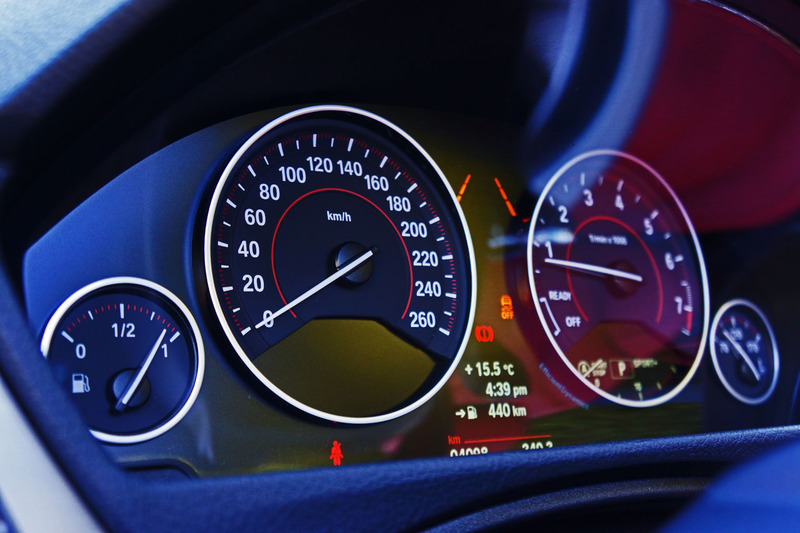 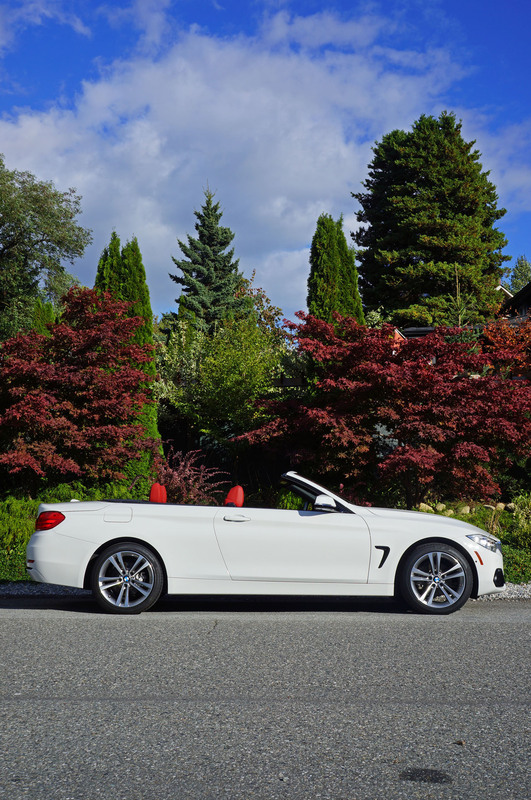 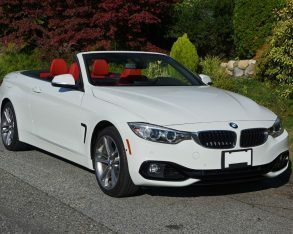 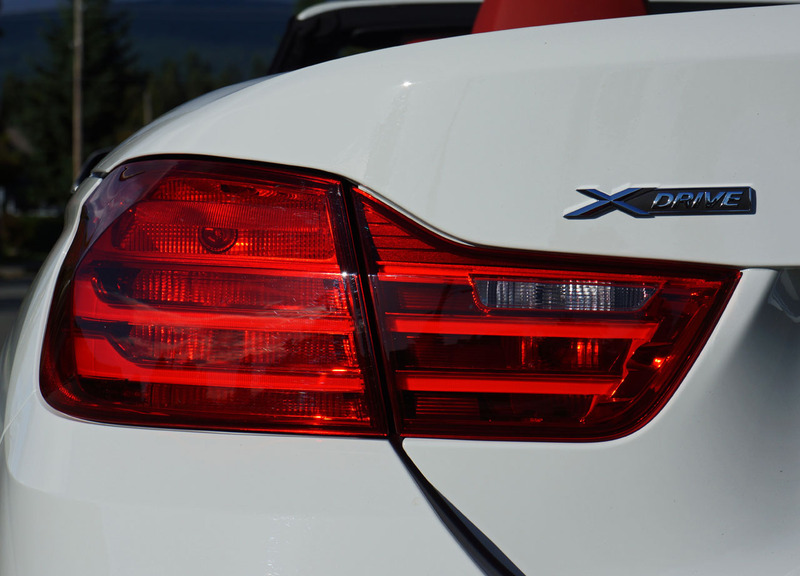 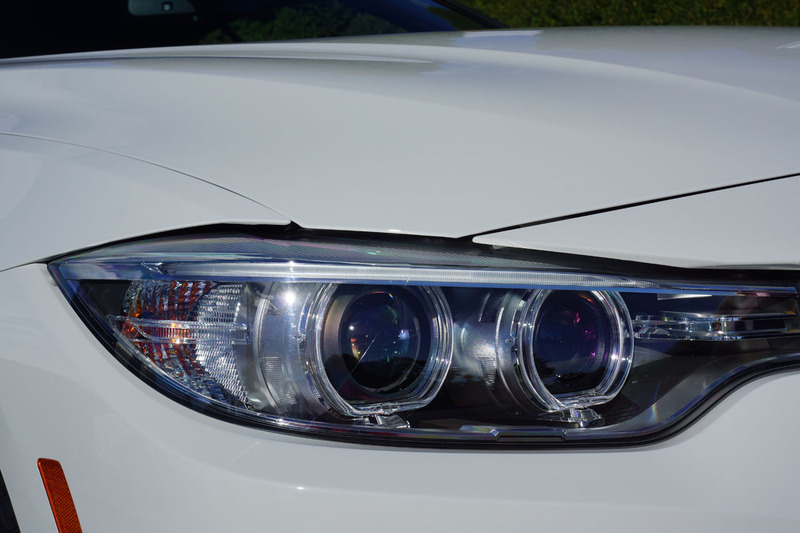 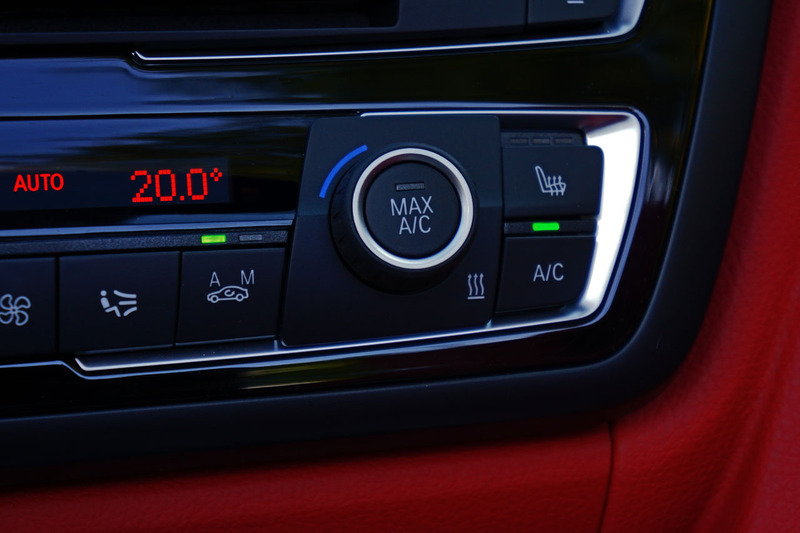 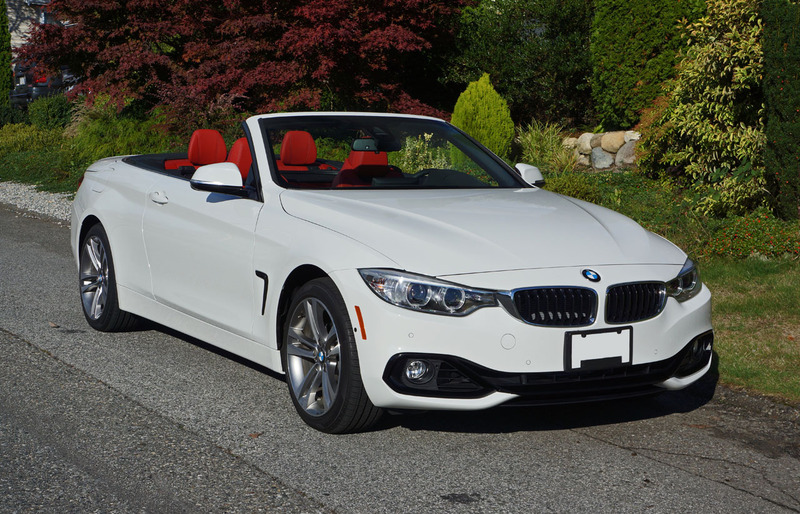 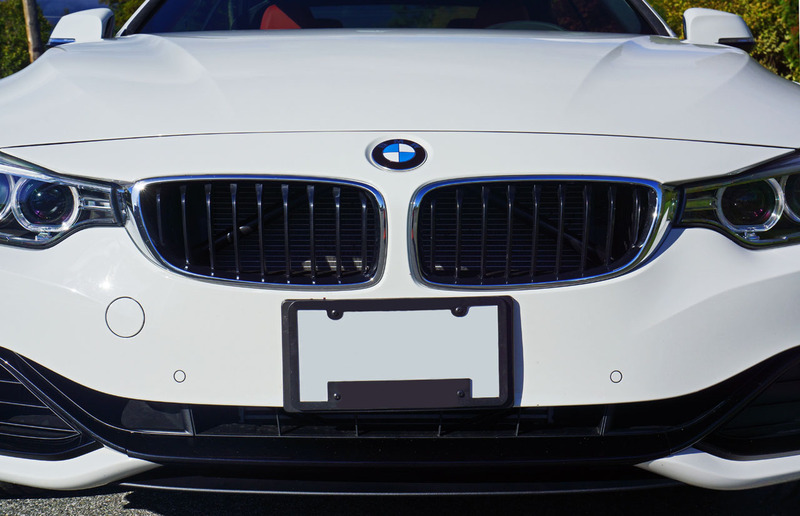 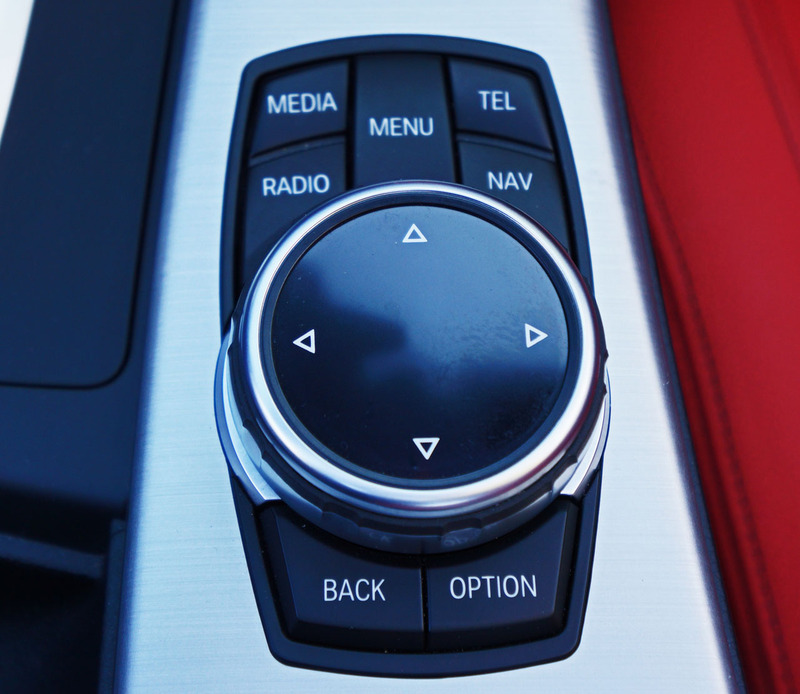 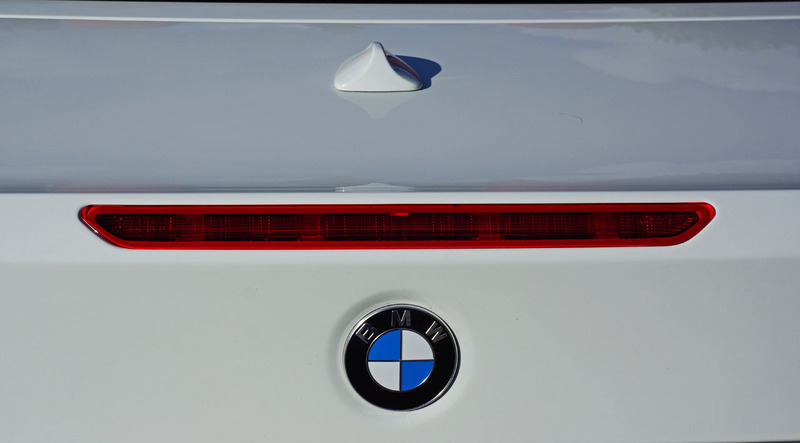 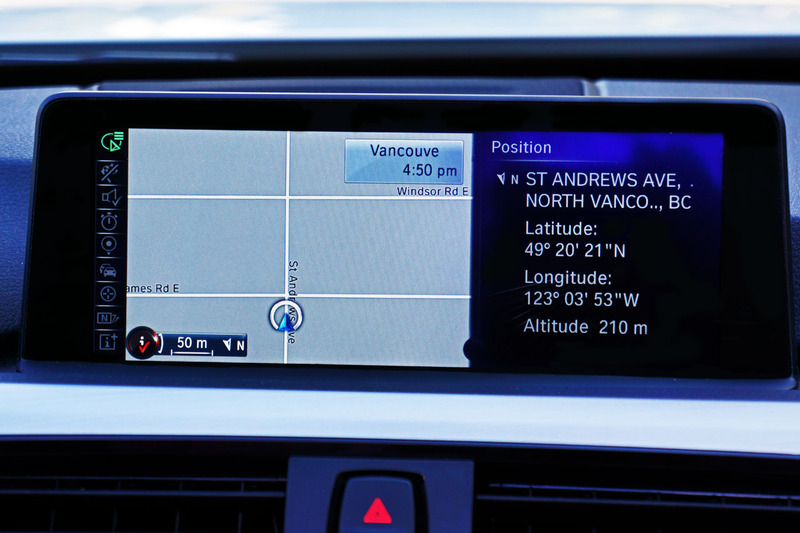 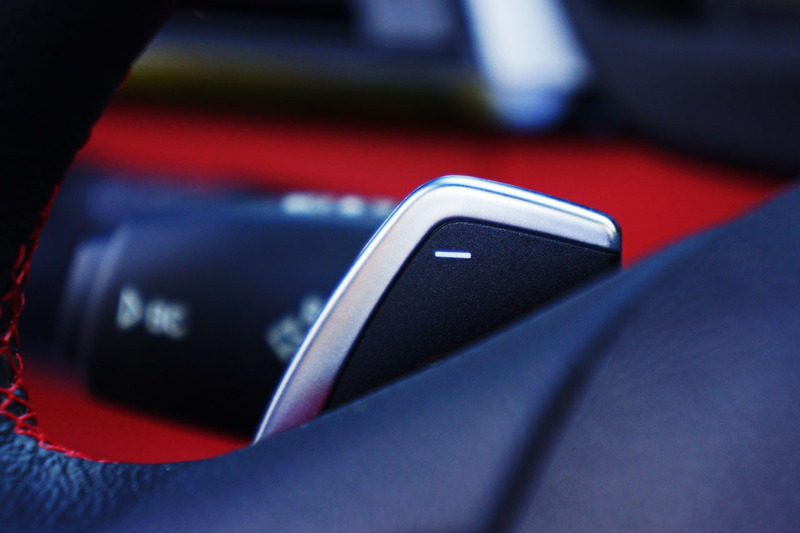 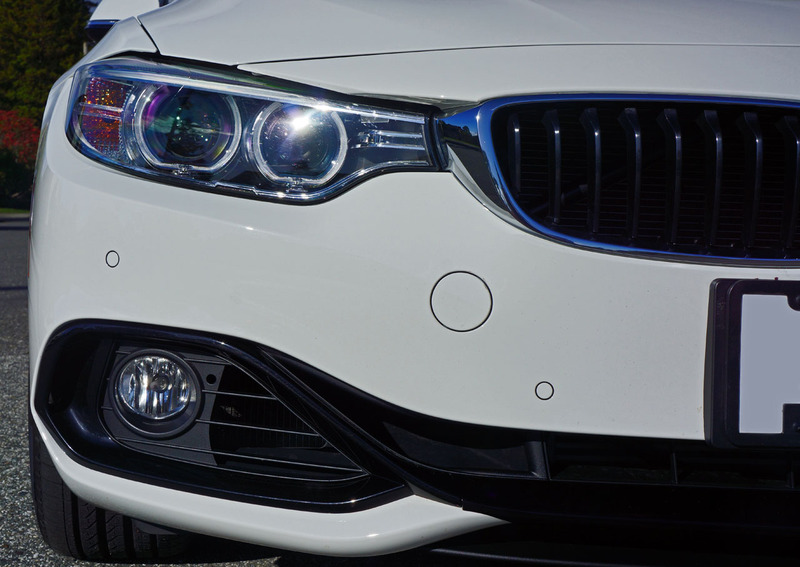 Lastly, my convertible tester included BMW’s ConnectedDrive Package that features Advanced Real Time Traffic Information, Internet access, BMW Online & BMW Apps, Remote Services, Concierge Services, and more. 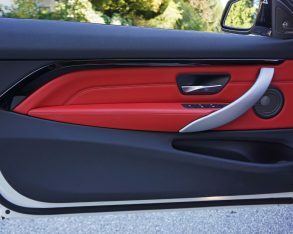 choice of five unique exterior colours, one of three interior trims including dark ash with metal inlays, burl walnut with inlays and Fineline anthracite, plus either black or Saddle Brown leather upholstery. 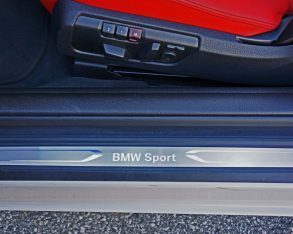 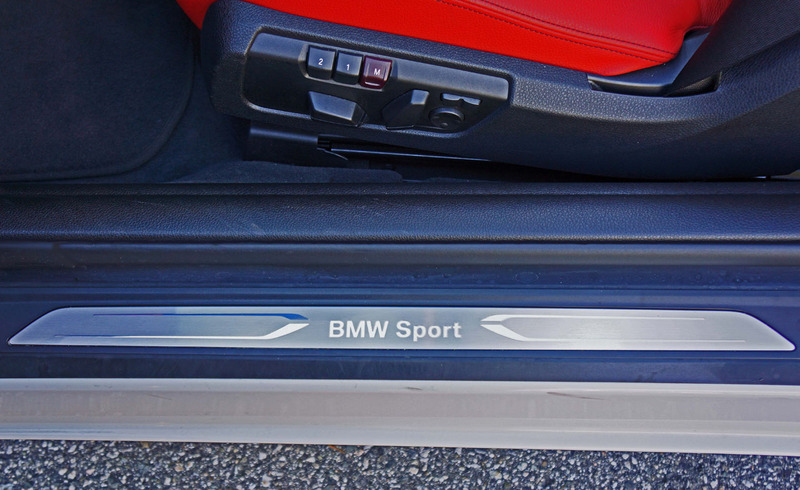 Special “BMW Individual” aluminum doorsills also come as part of this upgrade, along with additional chrome trim, an M Sport steering wheel, a leather-upholstered upper dash section, and a stylish set of V-spoke 19-inch alloys. 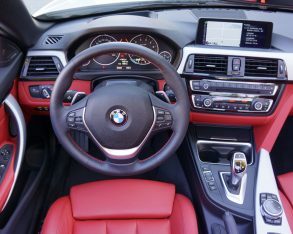 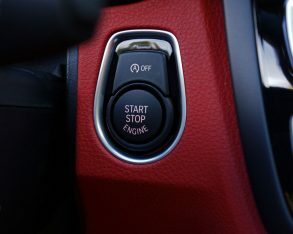 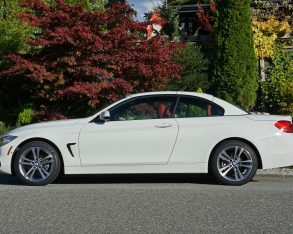 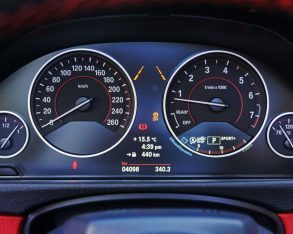 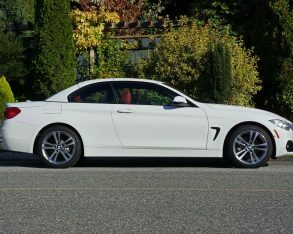 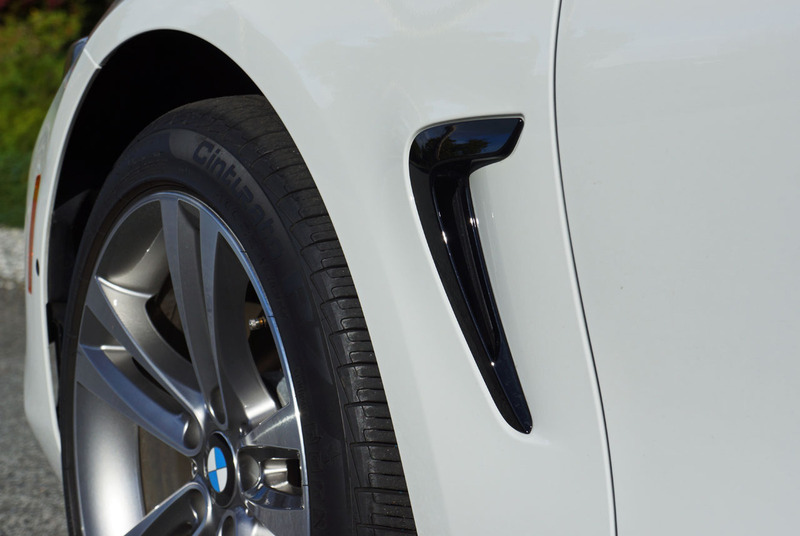 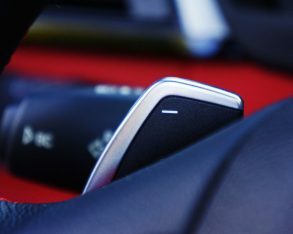 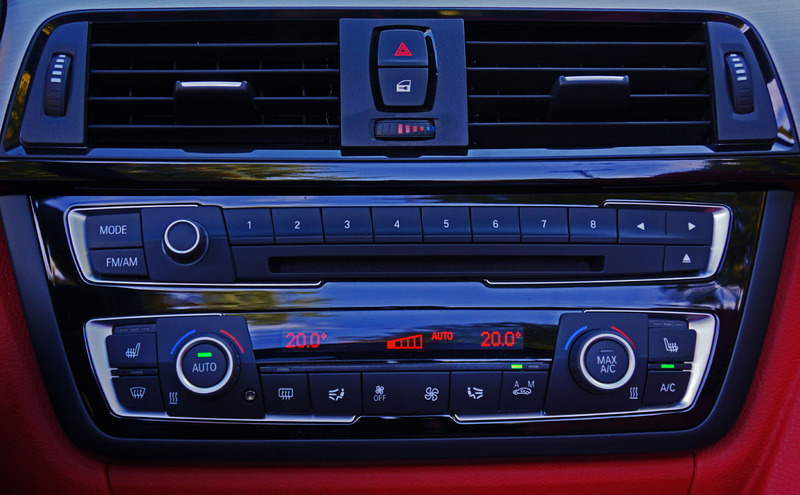 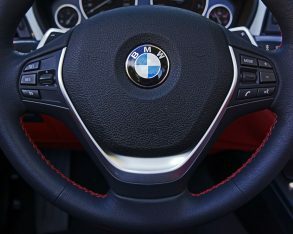 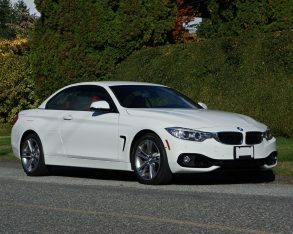 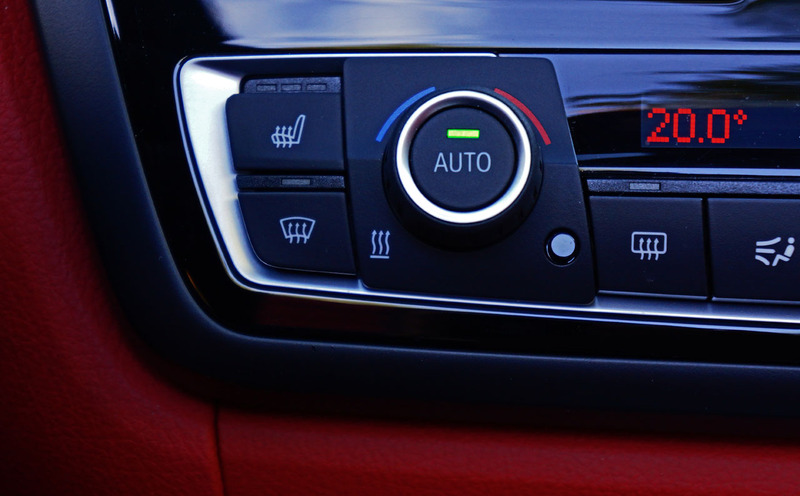 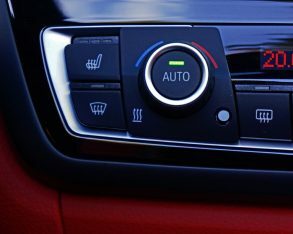 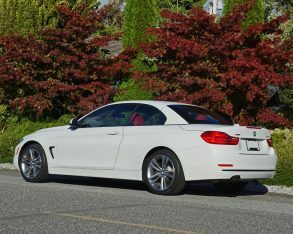 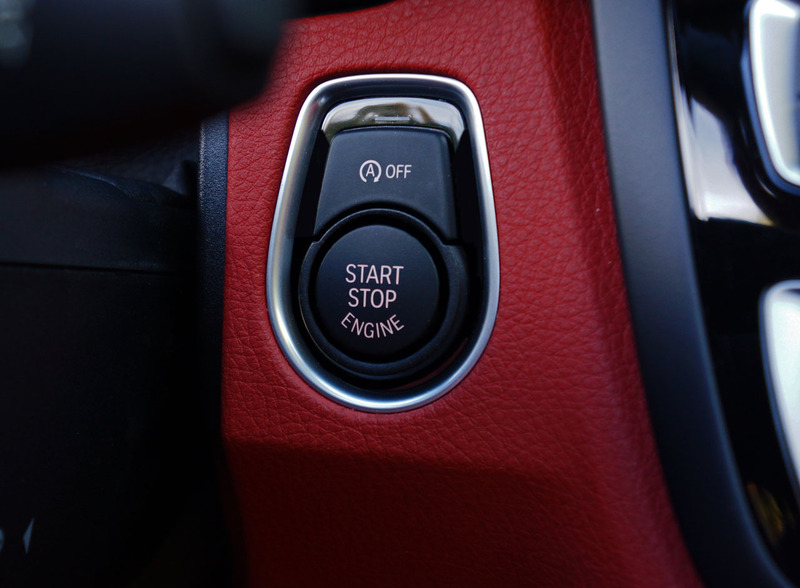 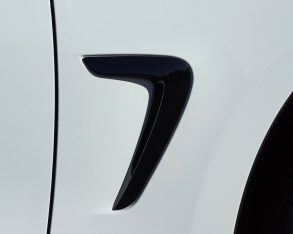 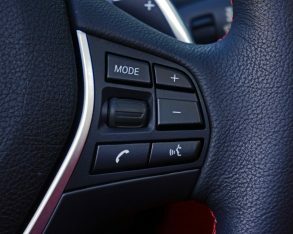 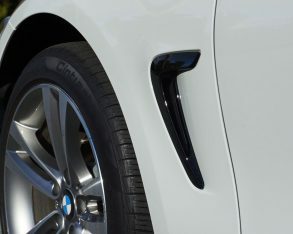 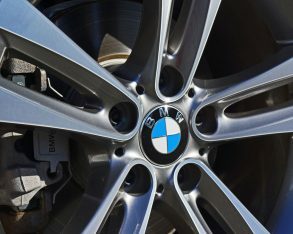 If you don’t want an entire package to get a given option, BMW allows you to pick and choose from an a la carte menu of standalone upgrades that includes the aforementioned M Leather steering wheel, leather dashboard topper, heated steering wheel, air collar system, lumbar support, auto-dimming side mirrors, and through-load system. 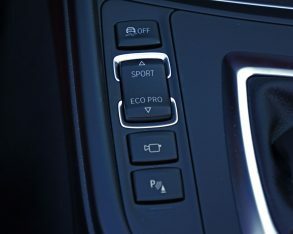 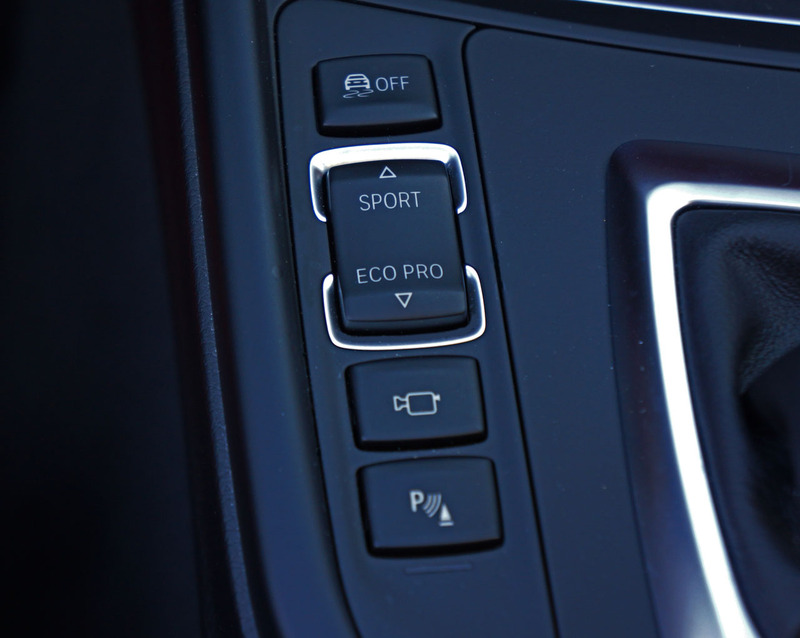 Eco Pro that retards throttle input, automatically short shifts the transmission and performs other fuel-saving eco-duties. 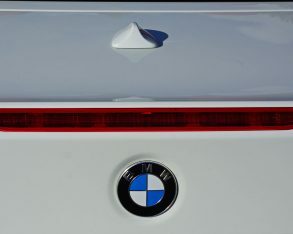 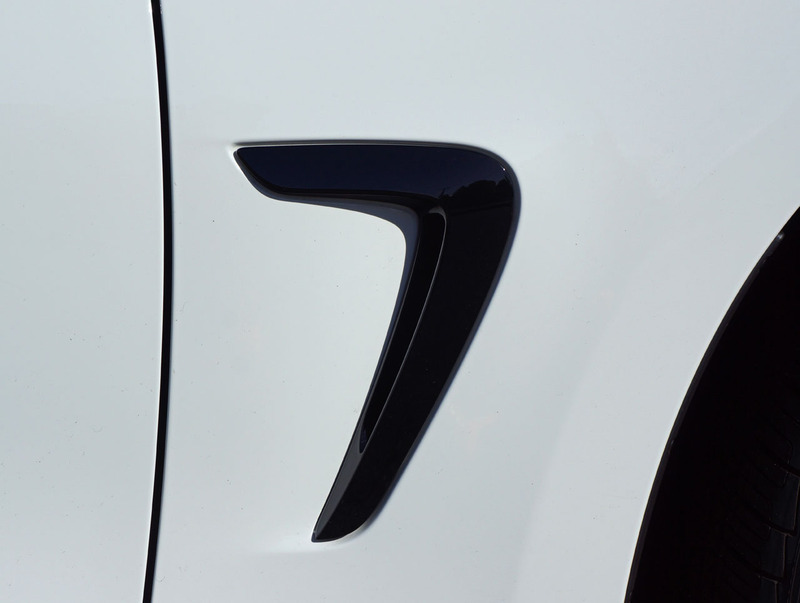 rating system, so the new five-cycle system will increase the identical car’s rating when the 2015 model debuts. 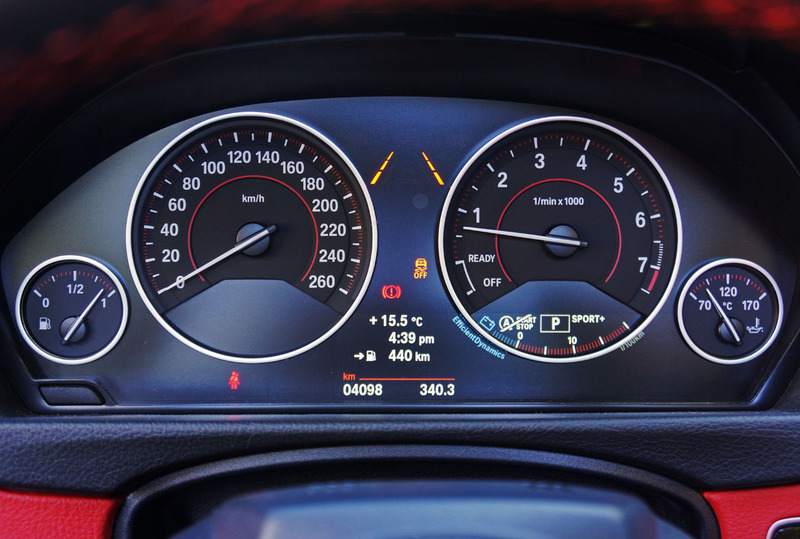 For the time being only use these 2014 numbers for comparison purposes, not as an indication of what you’ll likely be able to achieve if driving normally. 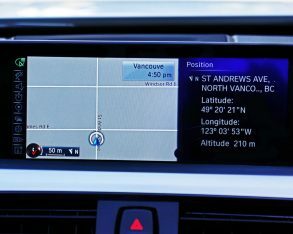 My real-world fuel economy, which included 10 days of driving over hilly terrain in city traffic and on the highway during cooler wet conditions was in the mid-9s, which is a bit higher than the U.S. EPA’s combined city/highway rating of 8.7 L/100km for the rear-drive model. 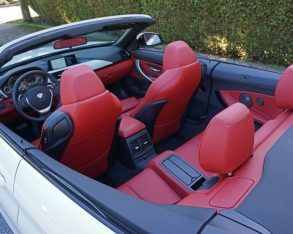 This is excellent for a luxury convertible with as much get up and go as the 428i xDrive Cabriolet, a real bonus when it came time to fill up. 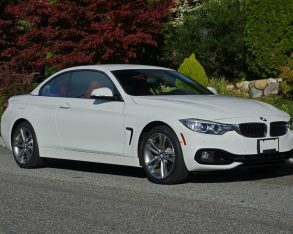 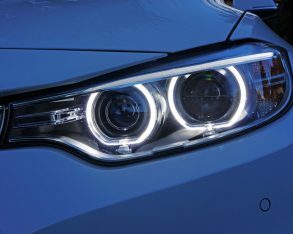 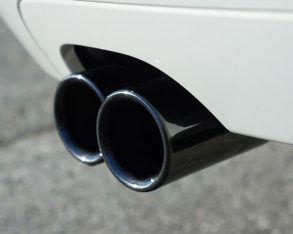 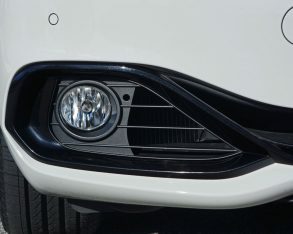 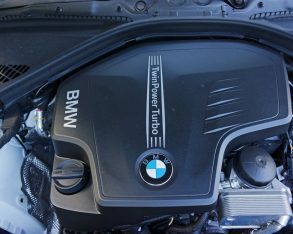 predates it, but the new model makes up for this with a brilliant little turbocharged four and eight-speed automatic combination that achieves very good fuel economy, while its overall balance of ride and handling makes it sportier than most rivals and more importantly, dialed in perfectly for its target market. 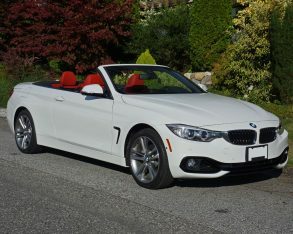 With what is easily the very best interior ever offered by the Bavarian brand in this class, filled with the most impressive array of standard and optional features, BMW’s latest 3… er, 4 Series drop-top is a wonderful car to wile away the miles in, and one that I’d accept back for another week’s drive anytime of the year without hesitation.